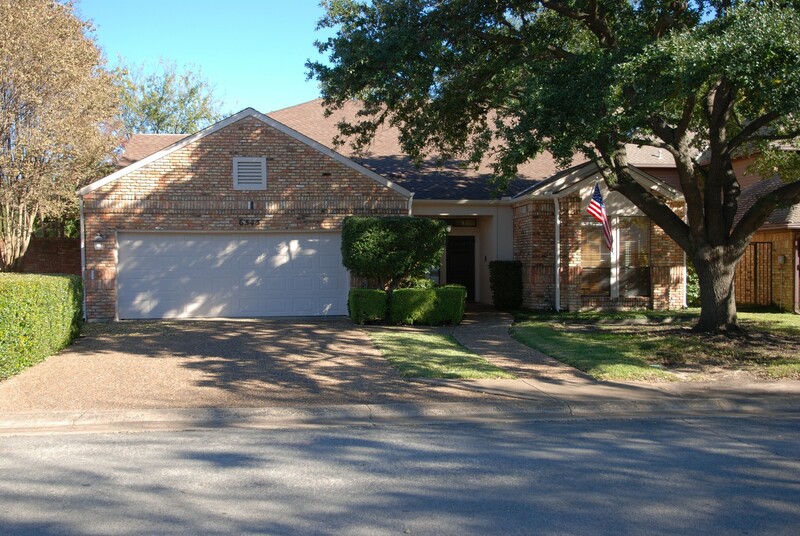 This week we have a great sale in the heart of the “Prestonwood” neighborhood in North Dallas with of hundreds of interesting items. We have many antiques. 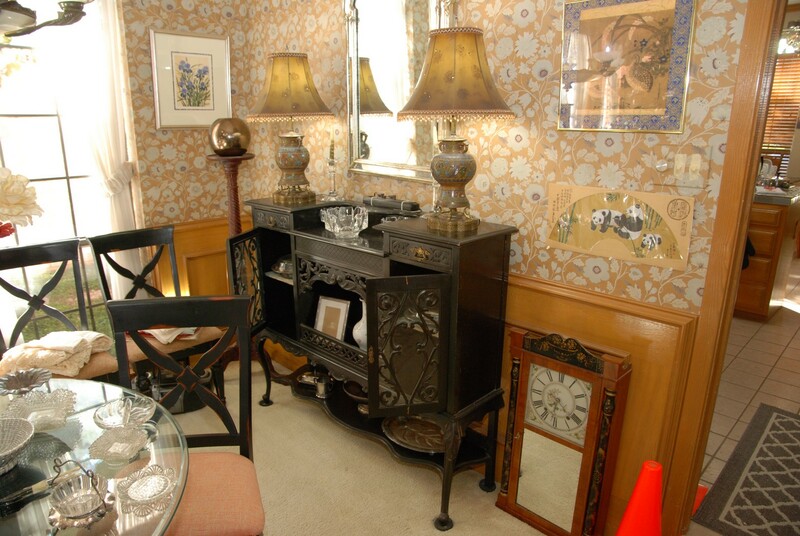 Some Victorian pieces date into the late 1930’s. There are some very nice crystal pieces, so come early for the best selection. We have an awesome sterling flatware set “Grand Baroque” pattern (66 pieces). This pattern was featured by Neiman Marcus when they celebrated their 75th year. 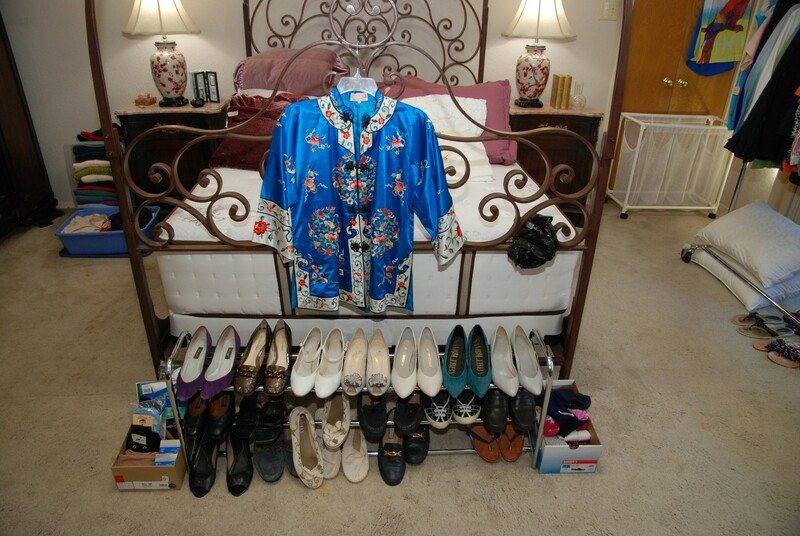 We also have some nice jewelry; costume, sterling and vintage pieces by Michal Nigrim. Come early for the best selection. We have a nice Hickory and White four-piece sectional in off white. 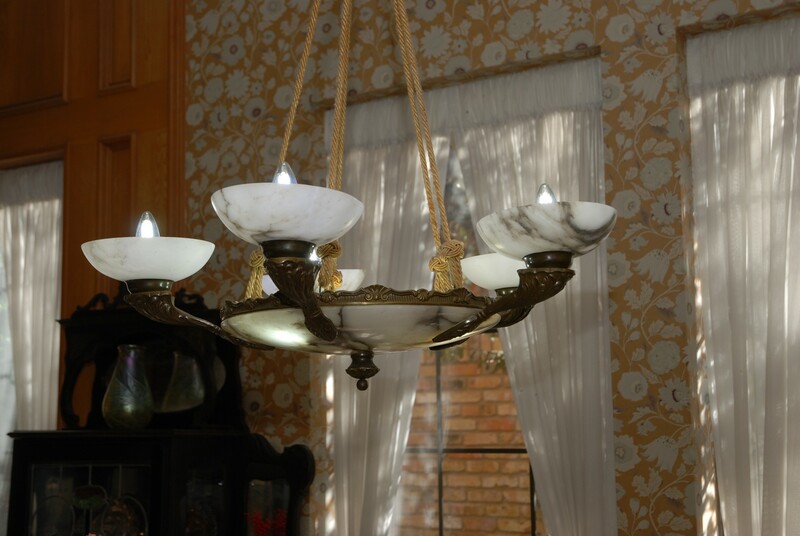 We have a fantastic Alabaster Chandelier from around the 1930’s. 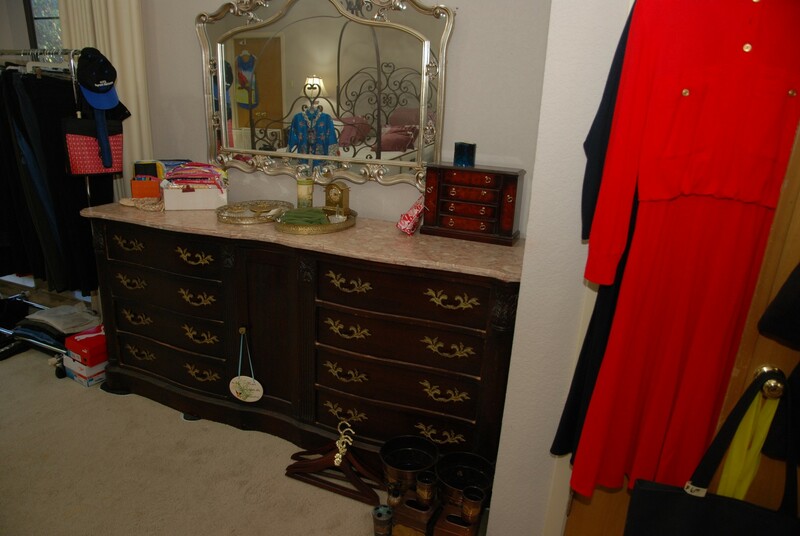 We also have a Birdseye maple dresser with mirror and matching headboard and footboard. There is a Tiffany style lamp (BNI), a Lars Heft Orrefors crystal bowl from Sweden, Bavarian pieces, and another Lars Heft Orrefors crystal three-bowl set from Sweden. 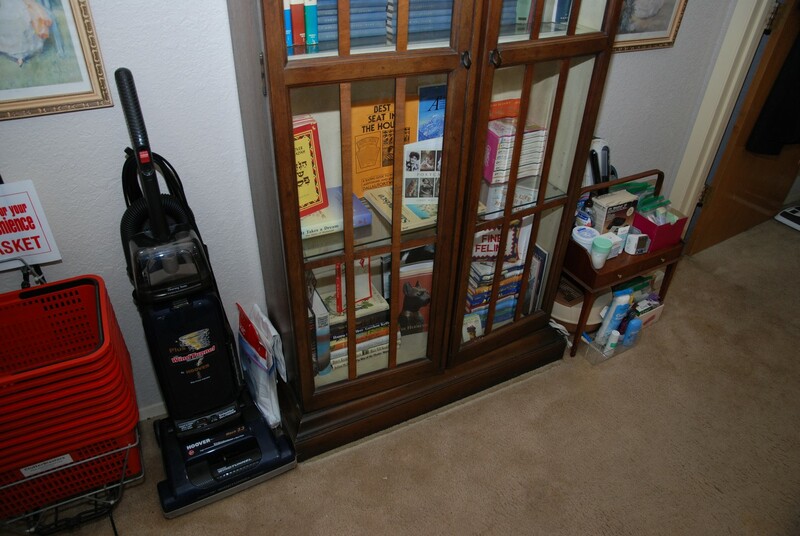 We have a nice Persian area rug (silk) 7’ x 10’ and a very nice Karastan area rug that is 5’.9’ x 9’. 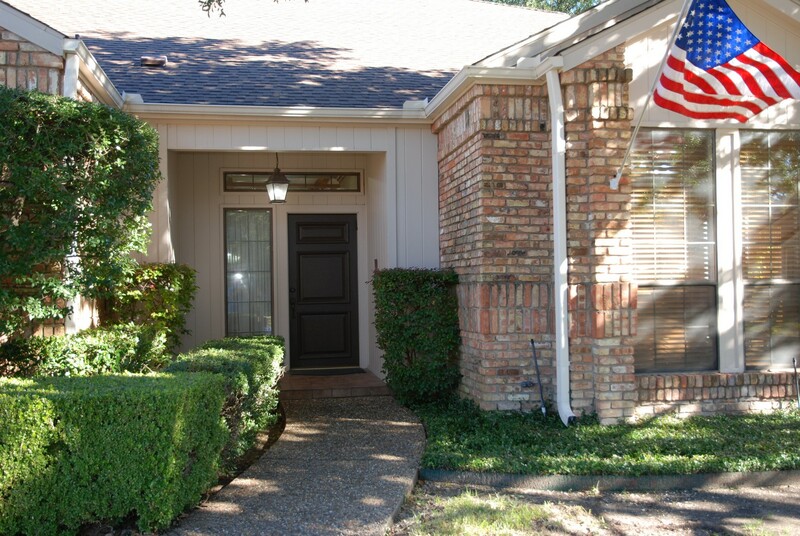 We will limit the number of people in the house and will distribute sequential to those who are waiting to enter. We’ll use the same sequential numbers for the serving order in the jewelry area located at check-out. Thanks for your patience! 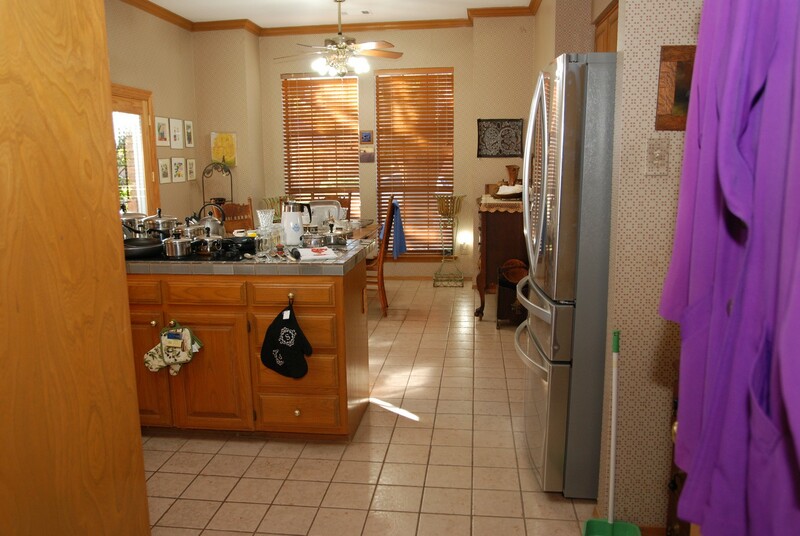 Entry / Dining Room / Checkout Area – features a vintage trunk which is in good condition for its age. 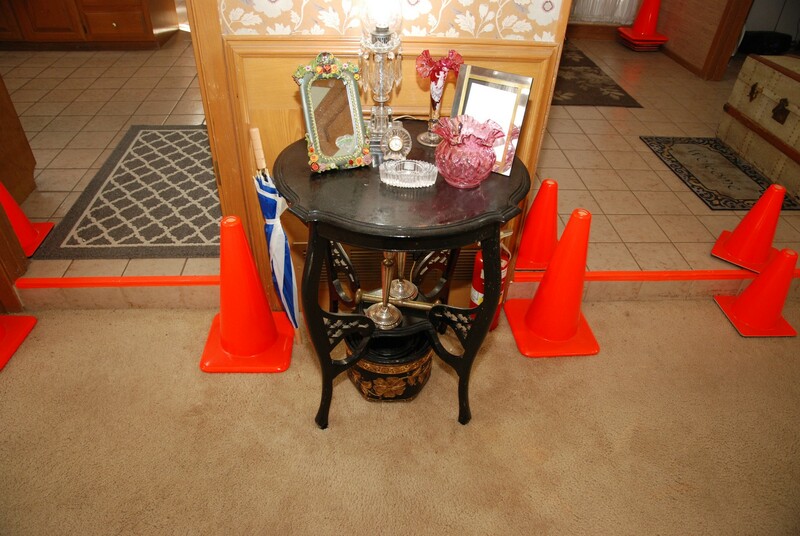 When you venture into the “dining area” please be aware there is a STEP DOWN – watch for the Orange Cones. The dining room features the awesome Alabaster Chandelier which has eight lights and sand cast bronze accents. The chandelier measures 24” x 38” (BNI) it also has a long fabric covered chain. 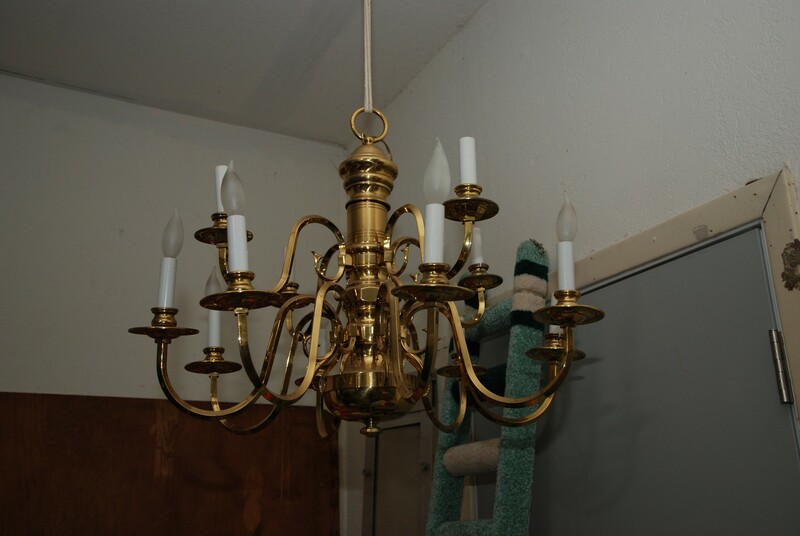 This chandelier is in excellent condition and is a real find, so come early for this sleeping beauty. 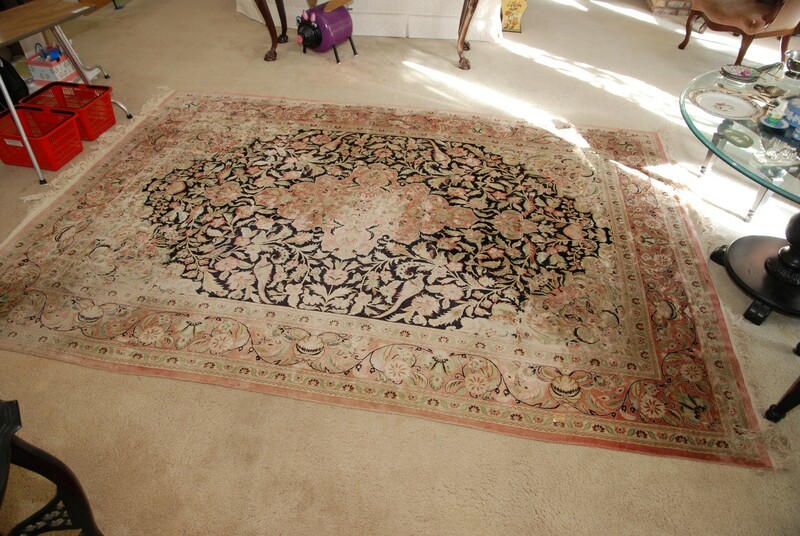 If you are looking for a nice Persian area rug we have one; it’s (silk) 7’ x 10’. It has lots of beige, pink, black, soft greens and blues. The fringes on each end are long and are in great shape. This one is sure to be a show stopper. 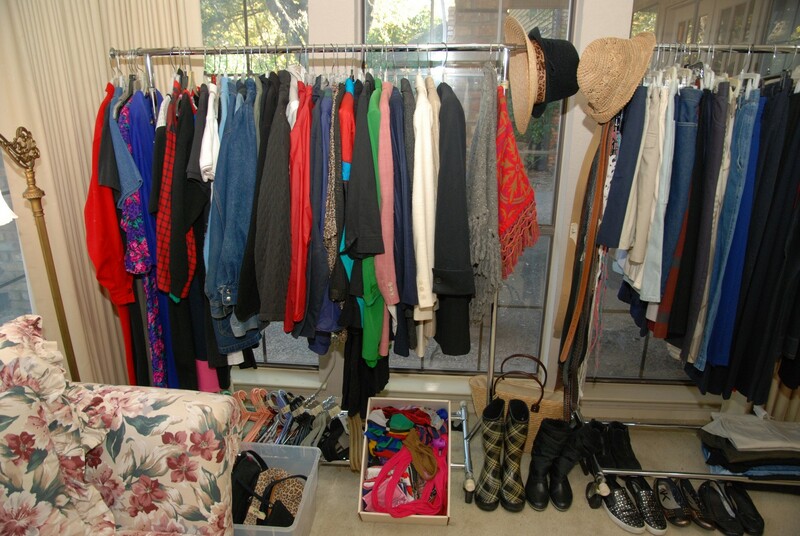 We have some nice jewelry; costume, and vintage pieces by Michal Nigrim. There are some interesting sterling cups (two sizes), and a footed gravy bowl. The best is an awesome sterling flatware set by Wallace silversmiths called “Grand Baroque” pattern. It has 66 pieces and this pattern was featured by Neiman Marcus when they celebrated their 75th year. 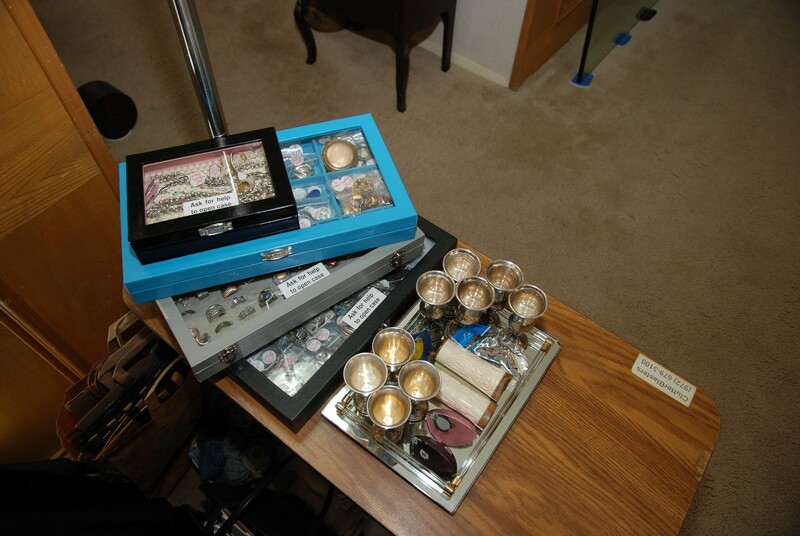 There are stone animal figurines, cuff links, tie tics, and tie bars. 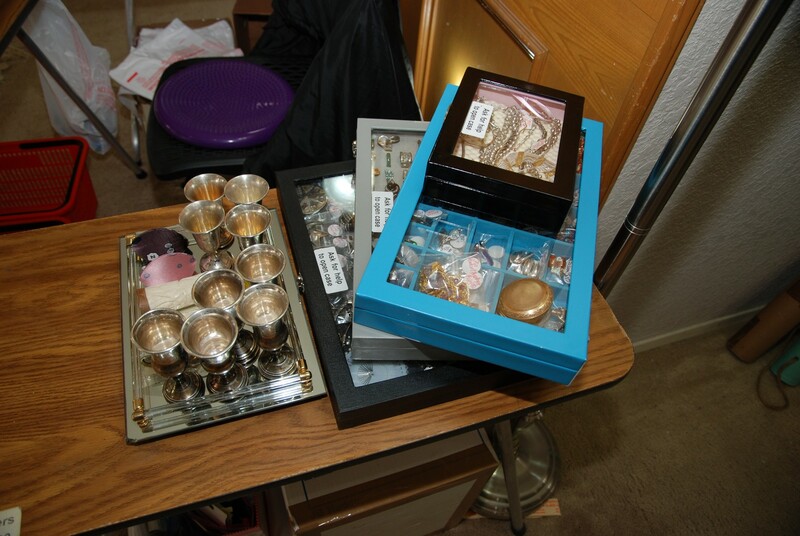 There is a basket of earring in plastic bags and a nice three-tiered necklace display with cultured & fresh-water pearls both coin and rice shaped. There are costume rings and some sterling rings, and an assortment of collectable trinkets, so be there on the first day for the best selection. 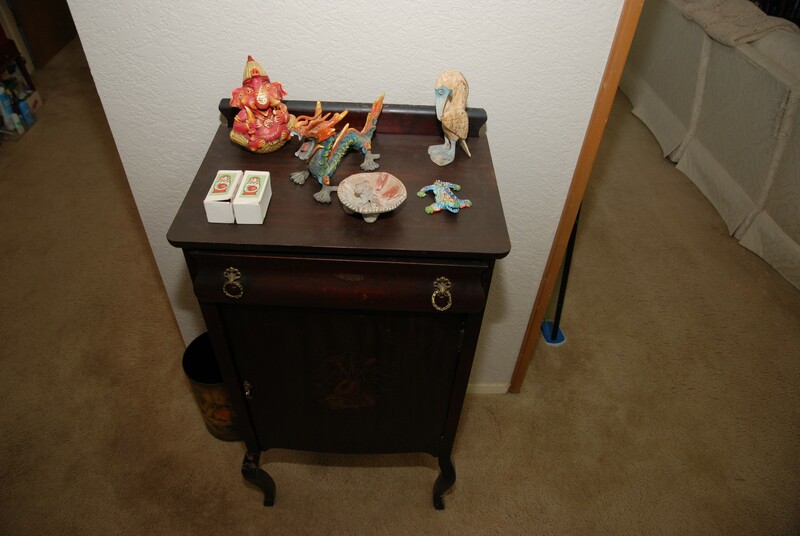 There is a claw and ball Rutherford sofa table in a lighter mahogany stain with some carved wood for accent. There are two matching lamps with pink fringe shades. 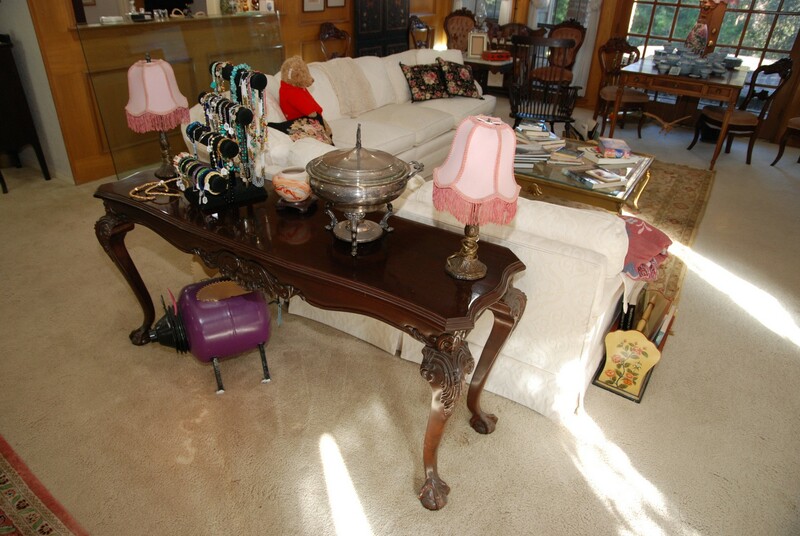 Then we have a great covered chafing dish with glass insert. 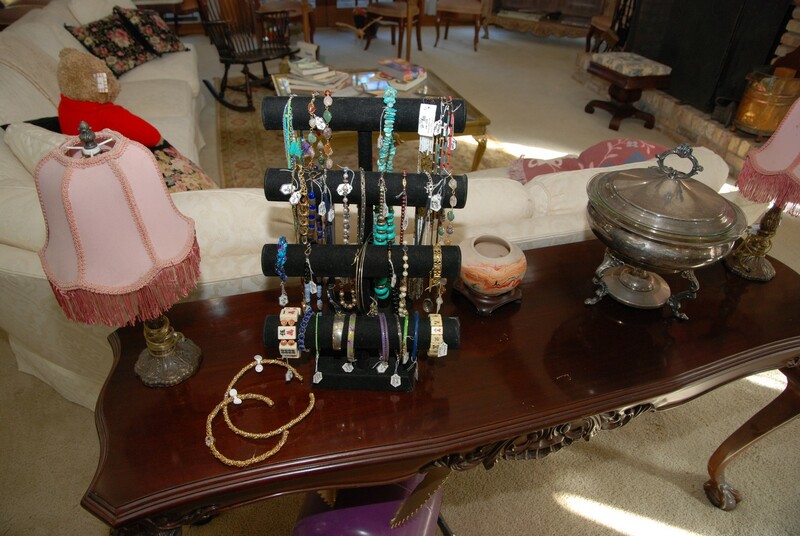 On this table is also a four-tiered necklace and bracelet stand. We have a very nice ornate round table with a small round shelf below. 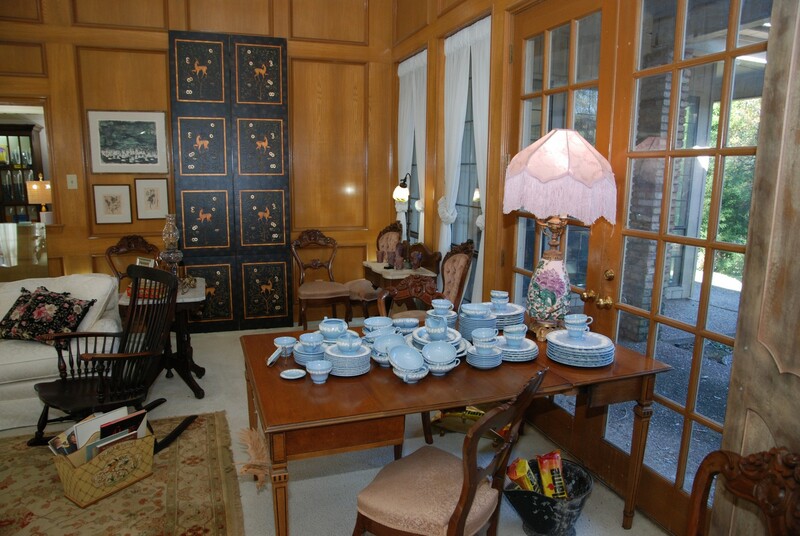 The wood is in great condition, and we have some very interesting items on the table. There is lots of interesting costume jewelry on this one. Some necklaces and bracelets are a more modern style and others are vintage style. 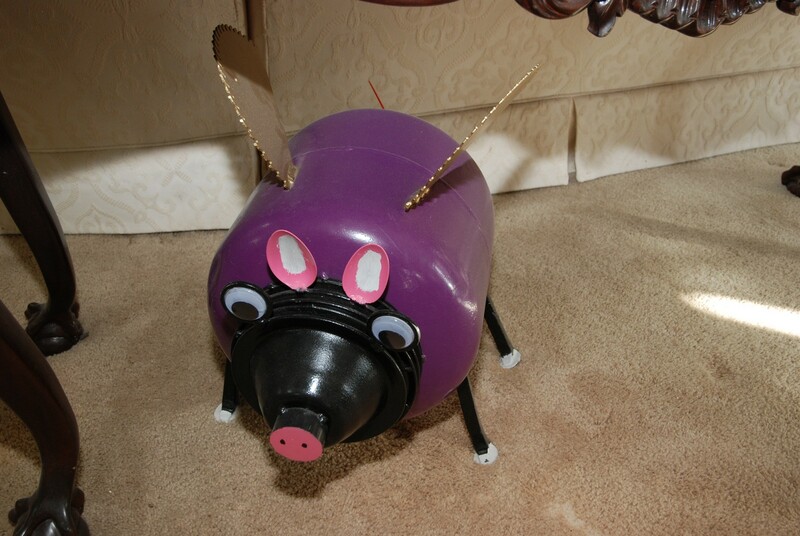 We have an interesting purple pig that was purchased in 2016. We also have a designer Peacock. 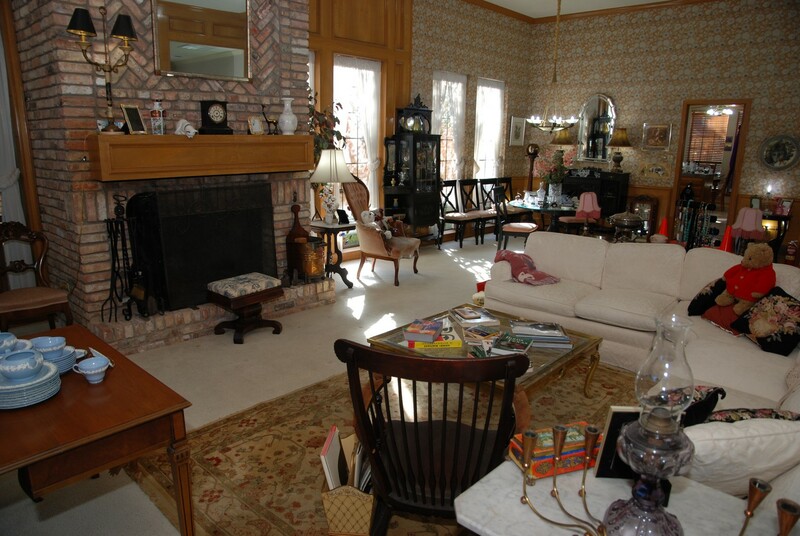 This room also has a nice round glass top table on an awesome mahogany wood round pedestal. If you are looking for a really nice gem (like this) look no further this one is for you. We have six great side chairs with nice upholstered seats with a crisscross back. 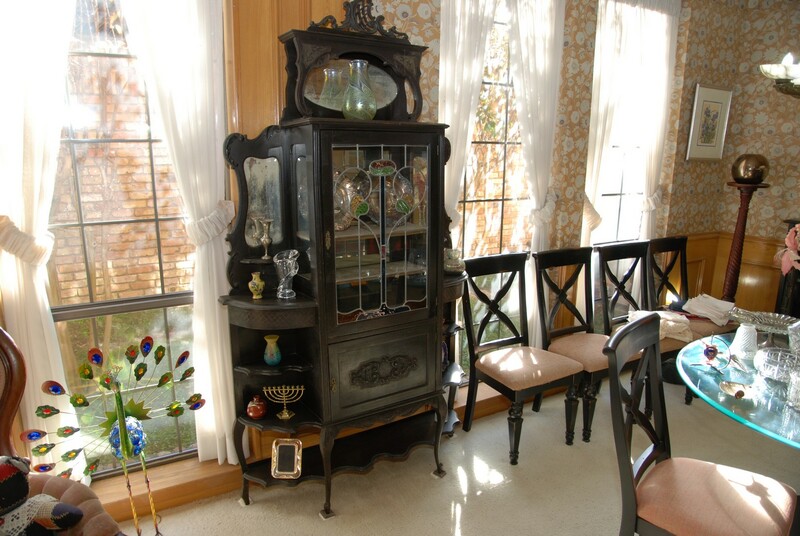 If you love a Victorian style book case / antique hutch look no farther than the beautiful one that has a stained glass single door with lots of great details with multiple small shelves and an open bottom with a larger single door at on the bottom for storage. 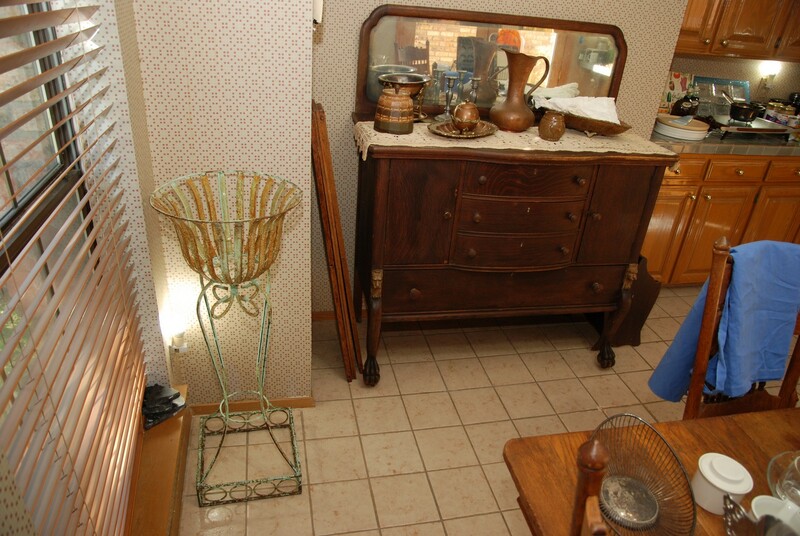 The top has a great oval mirror with lots of nicely carved wood. This definitely is a show stopper. 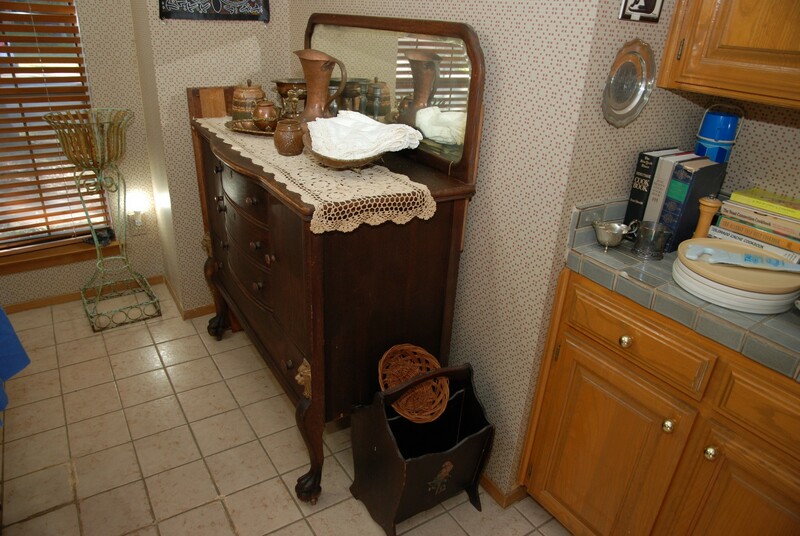 If you are looking for an awesome Victorian buffet, we have one. 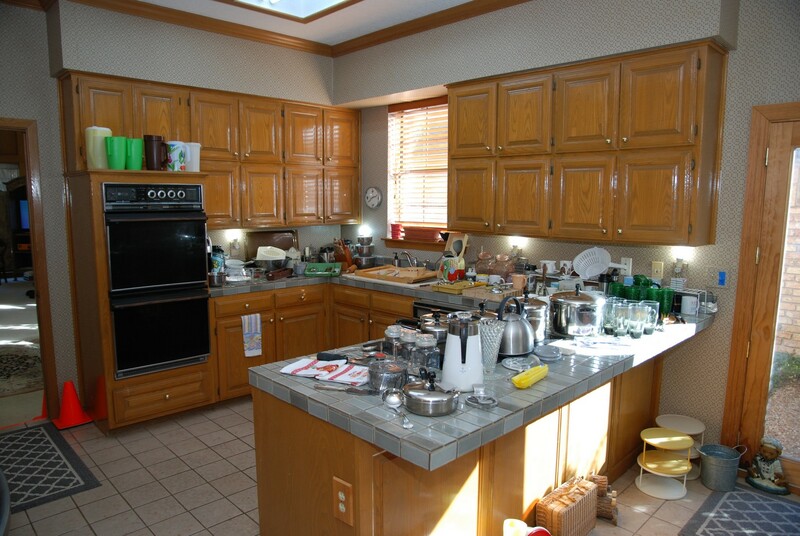 The middle section drops down while the outer sides keep their elevation to make room for a single drawer. 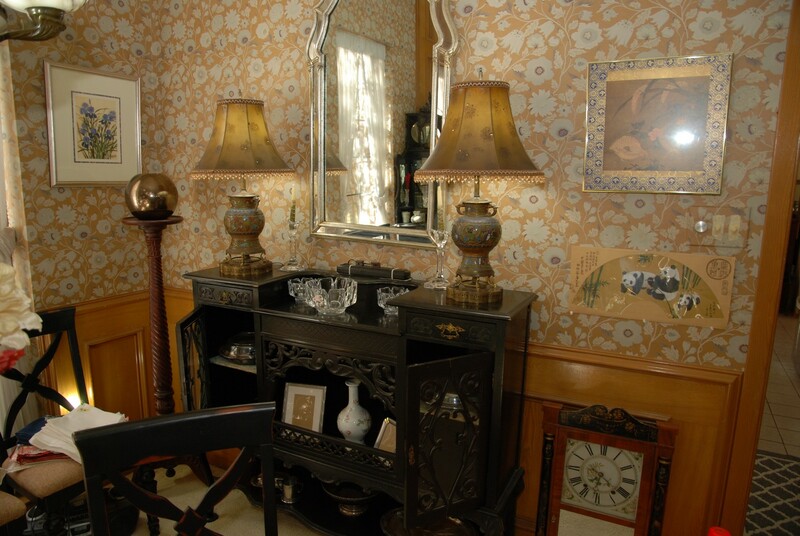 On this elevation we have placed a pair of identical antique lamps with Shades (BNI). We have two cast bronze urn table lamps each with its own stand. The urn part has blue and green coloring on the leaves. This pair is very nice, and the shades are both great. There is an awesome, unusual mirror hanging above this buffet. We also have Lars Heft Orrefors crystal bowls. There are three bowls in this set from Sweden, and the bowls will be sold separately. There is another larger Lars Heft Orrefors crystal bowl from Sweden along with some Bavarian pieces including a large cut-crystal vase. There is a great tall wood fern / plant stand in excellent condition. On top is a ball vase. 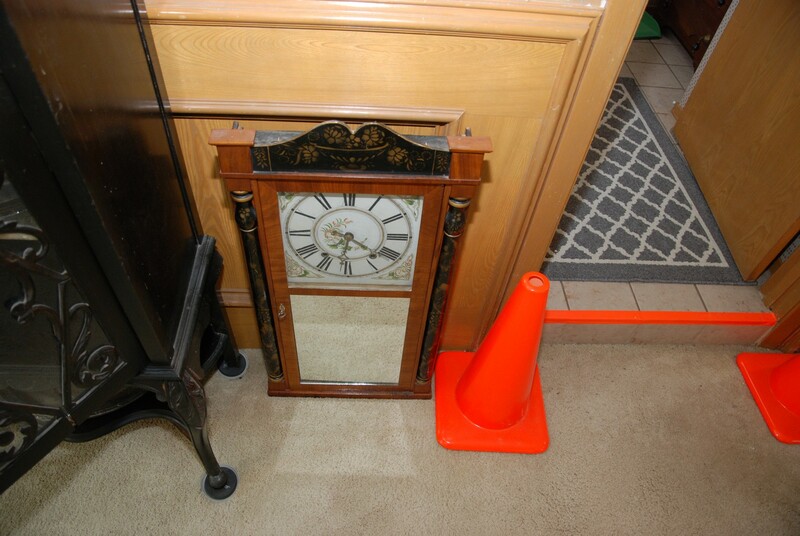 We also have a charming vintage wall clock with a mirrored door. 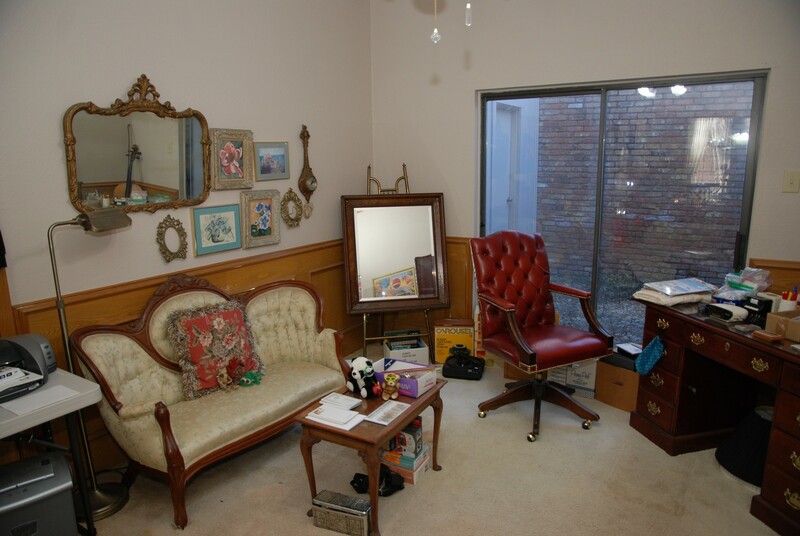 Office / Family Room – features an antique Victorian loveseat with a solid walnut frame with intricate design for furniture from the era, tufted center medallion 60" wide, 40" high, and 33” deep. 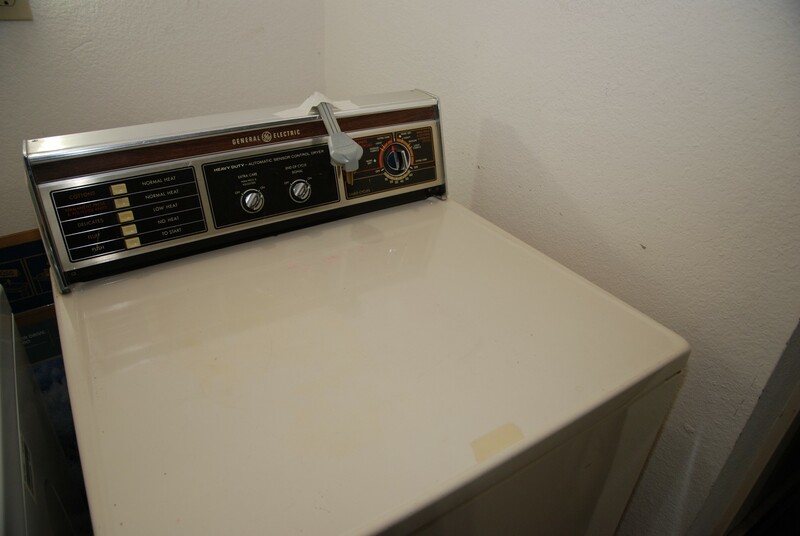 Though the fabric and wood frame show signs of wear with some discoloration, stain and scratches associated with usage, this is an awesome find. 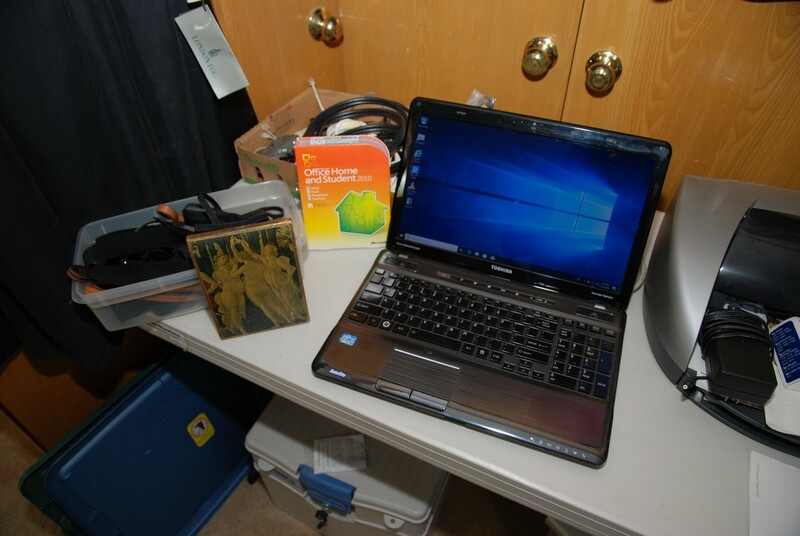 There is a nice laptop computer Toshiba Satellite 6 GB of RAM, Windows 10, and ready to go. 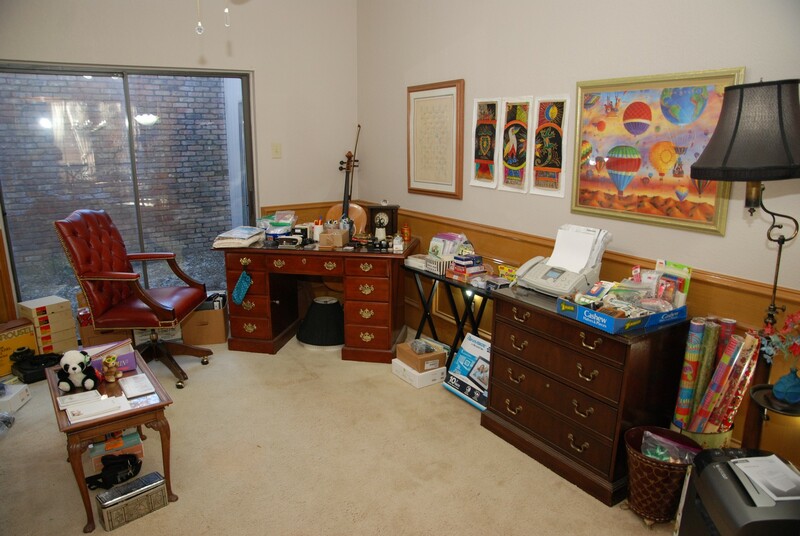 We also have an Office Home and Student 2010 software package with Word, Excel, PowerPoint and OneNote. There is a Brink’s Home Security Fire Box with key that will be at checkout. The firebox appears to be brand new. 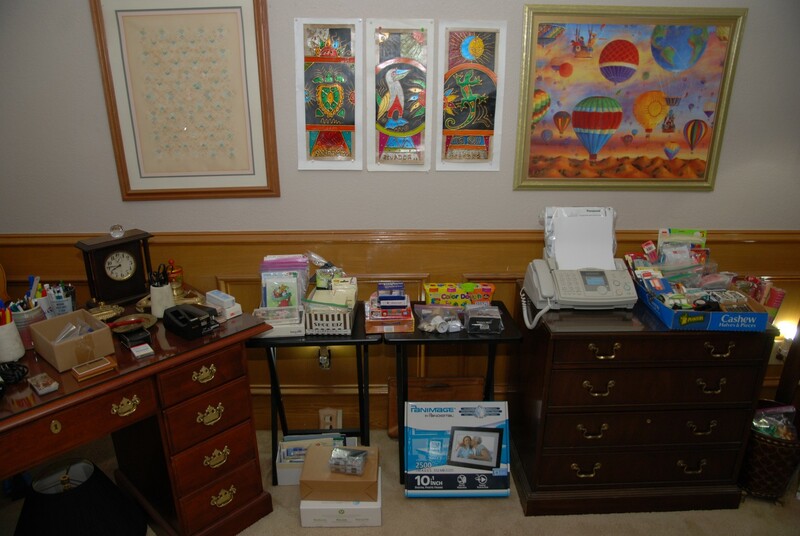 We have two shredders and an HP Deskjet 5550 printer. 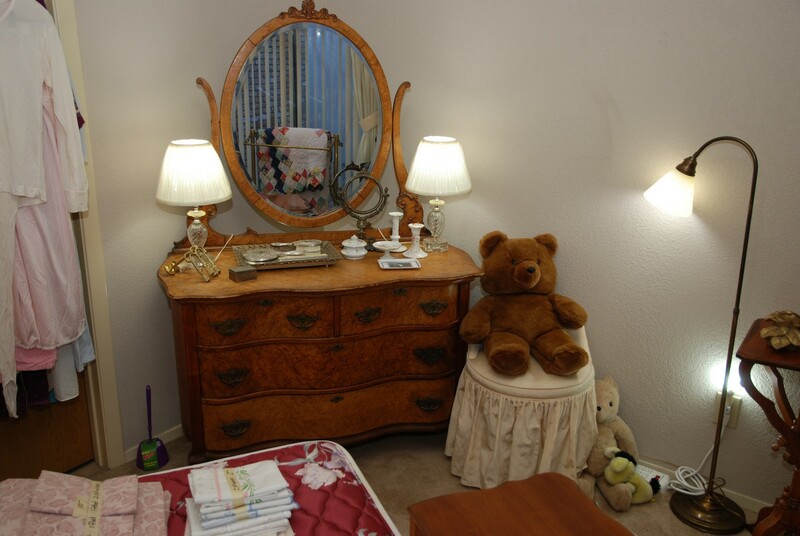 We have a vintage gold-framed mirror and some nice pictures on the wall. There is a very nice brass easel in great condition and dark wood-framed beveled mirror. We have a glass-bottom tea table. The top slides out to use as a tray. We also have a Kodak 760H Carousel Projector and a few Carousel trays. 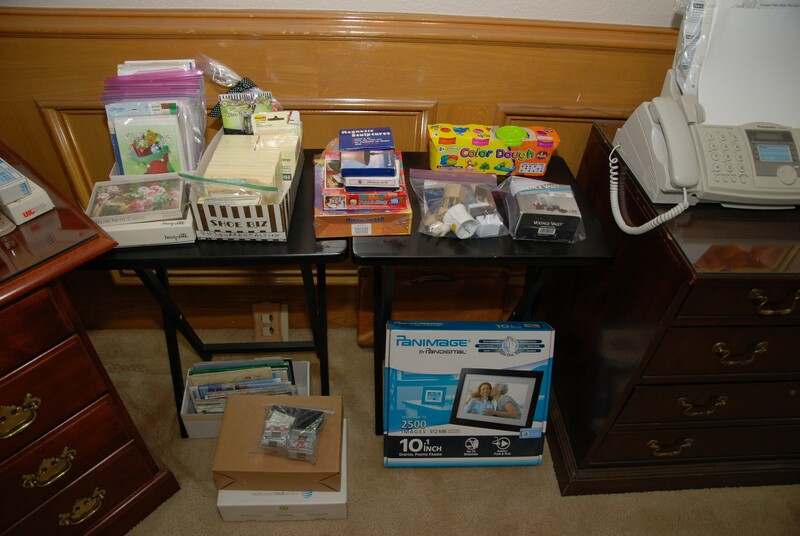 There are lots of office supplies in boxes along with lots of additional items on the desk. The desk is in great shape and has drawers on each side and in the middle. There is a key that locks the drawers. The key will be at the front check-out. We have a Cello which in in need of some tender loving care. 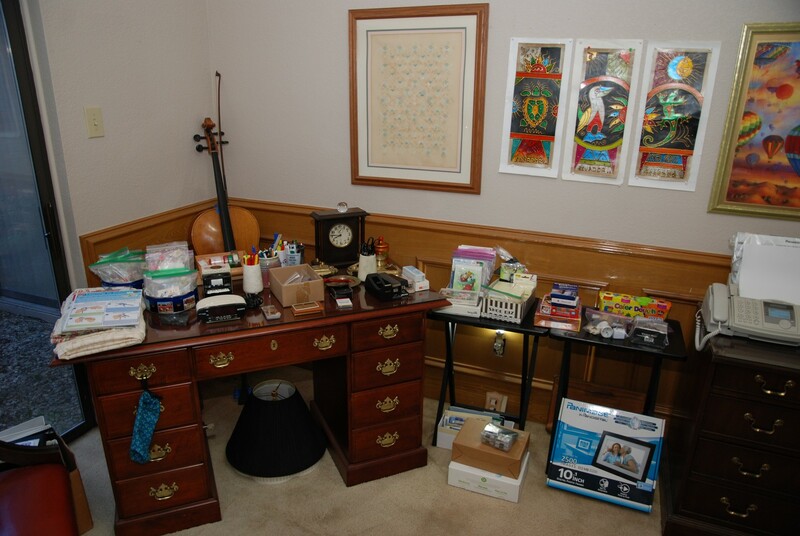 There are all sorts of desk items on the desk along with a vintage clock. There are two dark wood TV trays with more items that are craft and office related. There is a Panimage 10” Digital Photo Frame that holds up to 2,500 images (new in the box). 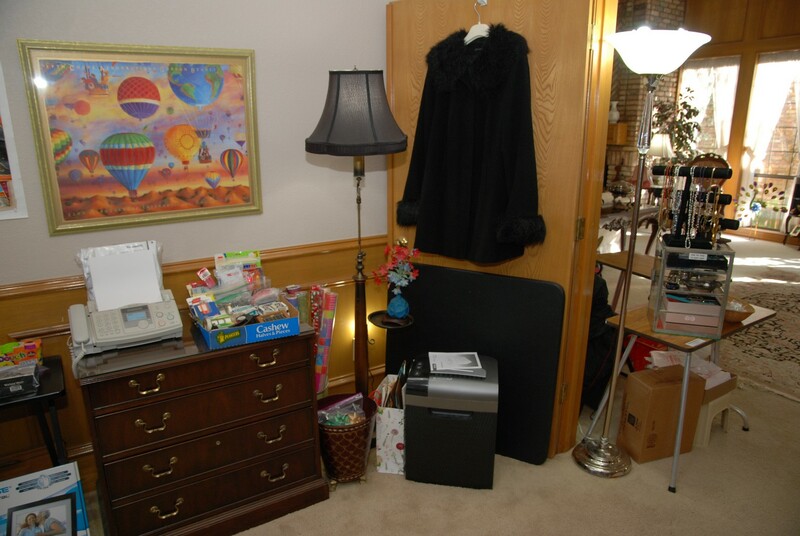 We have a nice lateral file / credenza with even more office items. The wall is full of interesting framed art. There is a new pair of Ladies Ice Skates – white with blade covers. There is a bottom tufted Leather Executive Arm Chair in burgundy that swivels and tilts. This Executive chair is in like new condition. 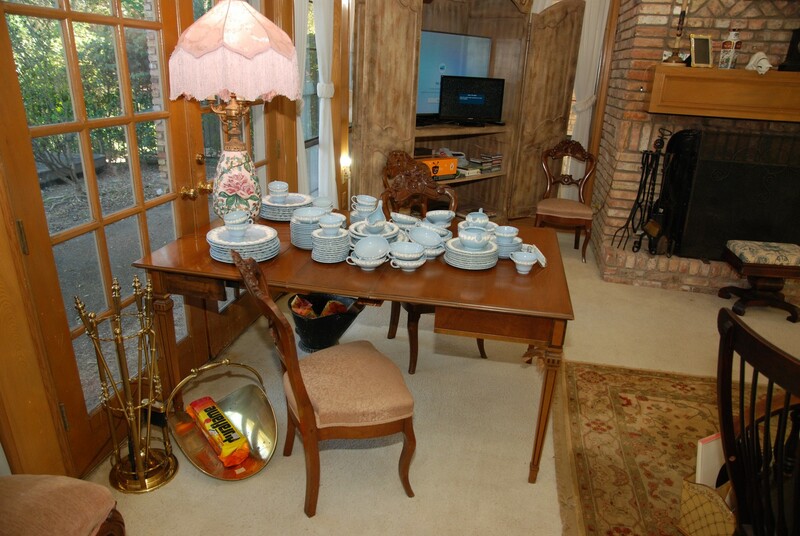 We have a nice folding table along with a vintage floor lamp with small round tray. There are some interesting clothes on the over-the-door hangers in the office. If you are looking for a Panasonic plain paper fax and copier we have one. 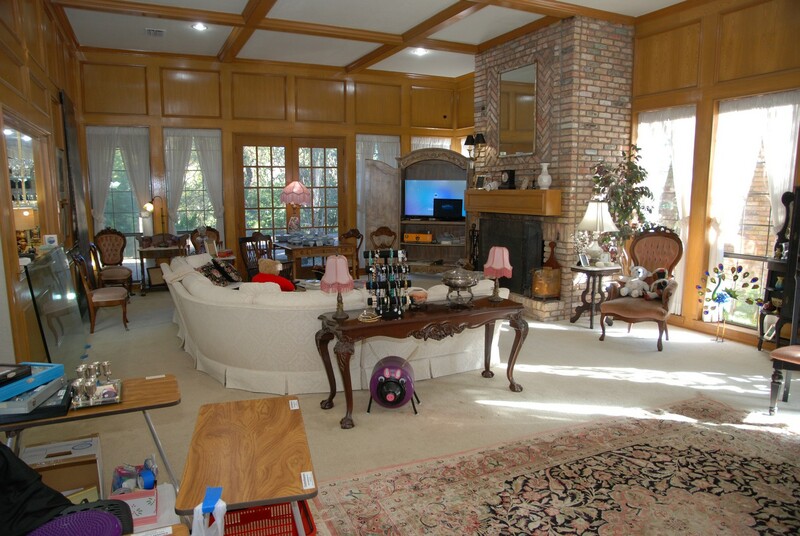 Living Room / Bar – features the great Karastan area rug. It measures 5’.9” x 9’.0” and the pattern and color is: Mahira / Antique Oushak (sunwash) and it is made of premium worsted New Zealand wool pile for softness and durability. It is Moth and Insect resistant. Make sure you come early for this awesome rug. 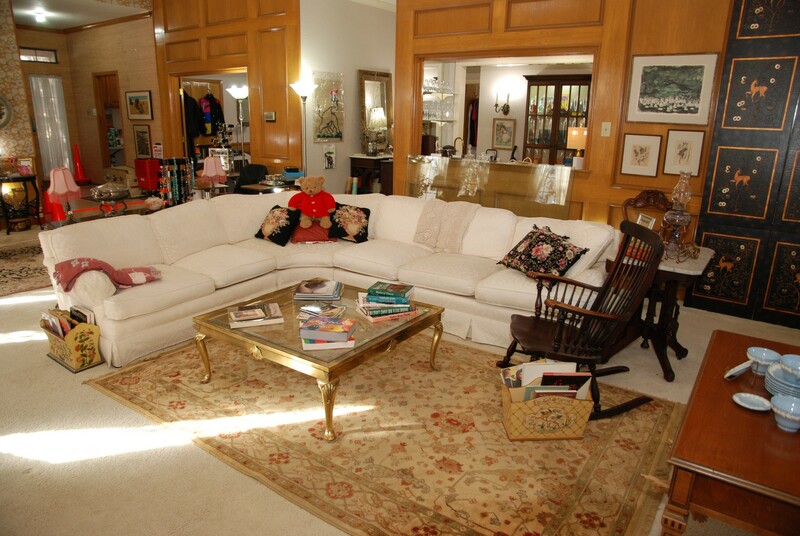 Here is where you will also find the Hickory and White four-piece sectional in off-white. It has two matching pillows as well. Since it’s a four piece sectional the combinations are numerous. 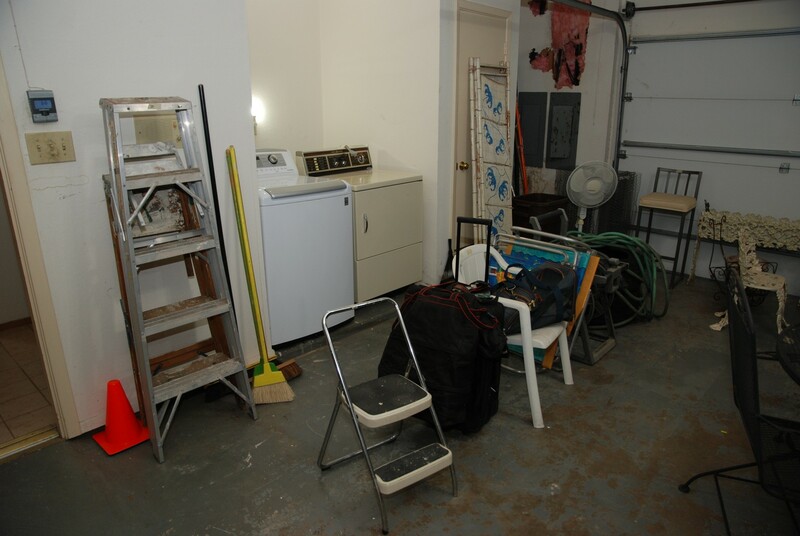 We will price the pieces separately. 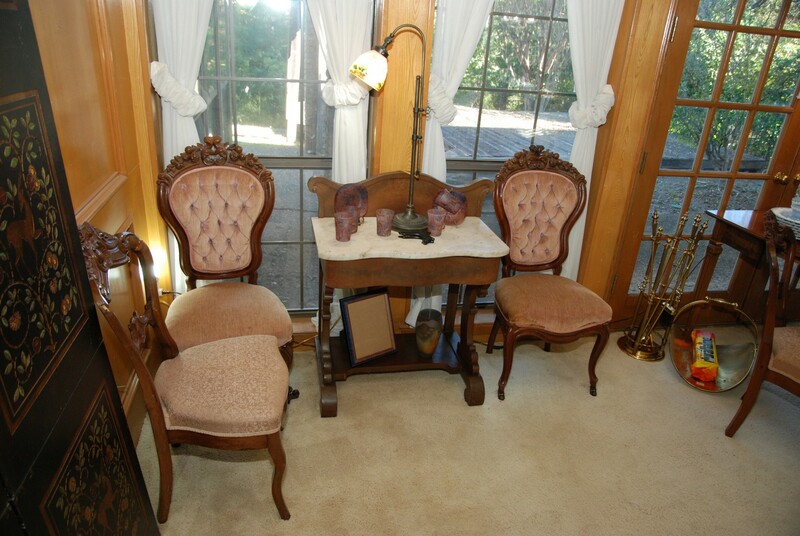 There is a great three-piece Victorian chair set that also will be priced separately. 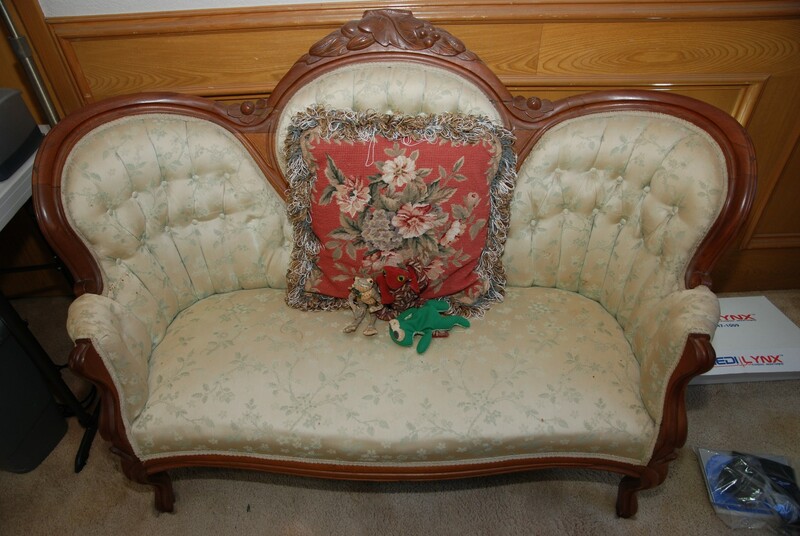 We have a Kimball Victorian Rose Carved Parlor Chair and two collectable patchwork bears (a boy and girl bear). 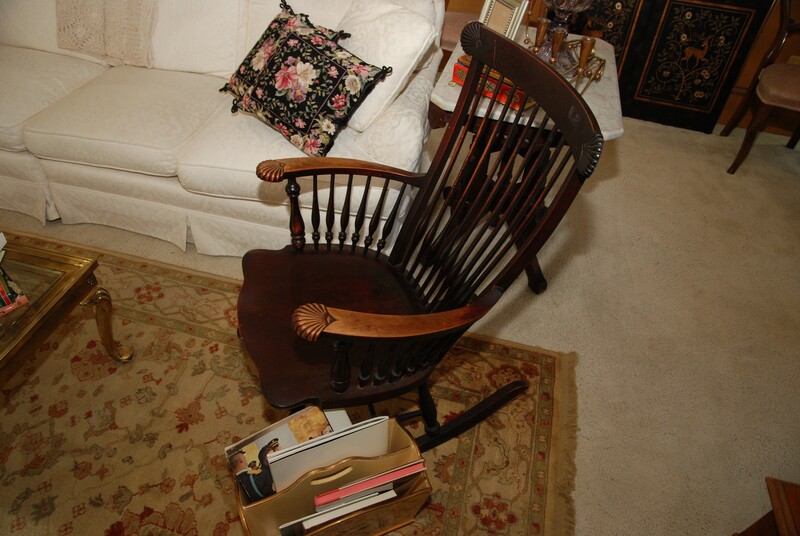 The two smaller chairs are also Victorian. There are a few side tables that have nice off-white marble tops. One has an Alabaster lamp with shade (BNI) along with two Alabaster trinket jars with covers and an Alabaster vase with cotton stalk. There is a smaller imitation tree with planter and a great off-white marble top East Lake side table. 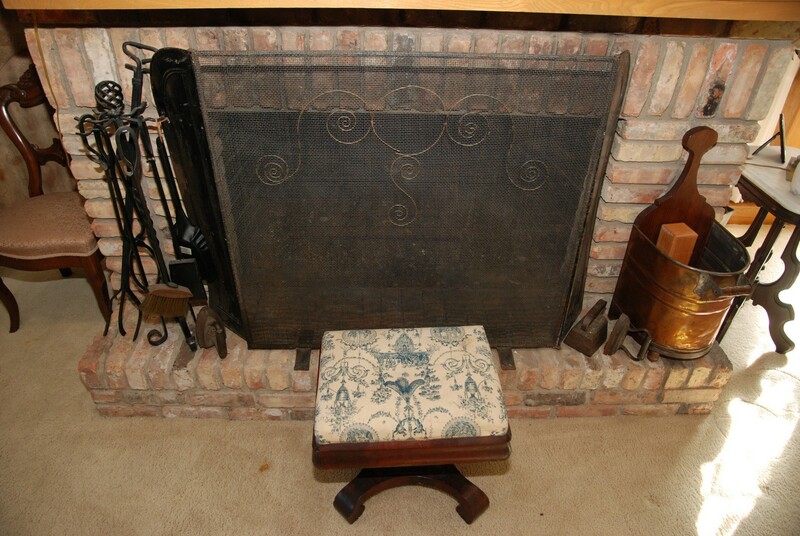 We have a vintage three-sided black fireplace screen and a black iron fireplace tool set. There is a nice vintage footstool and a copper and wood back firewood container. We have an art nouveau style mirror above the fire place. 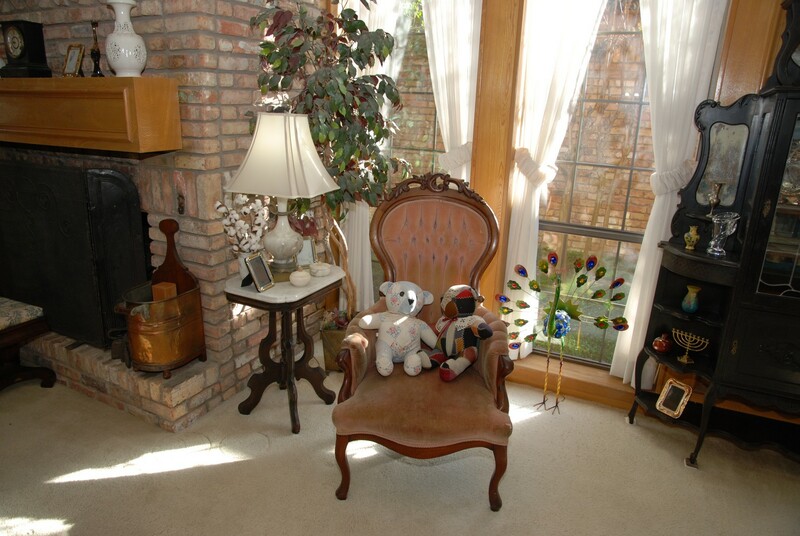 We have a double shaded lamp (BNI) on the hearth along with a vintage clock. 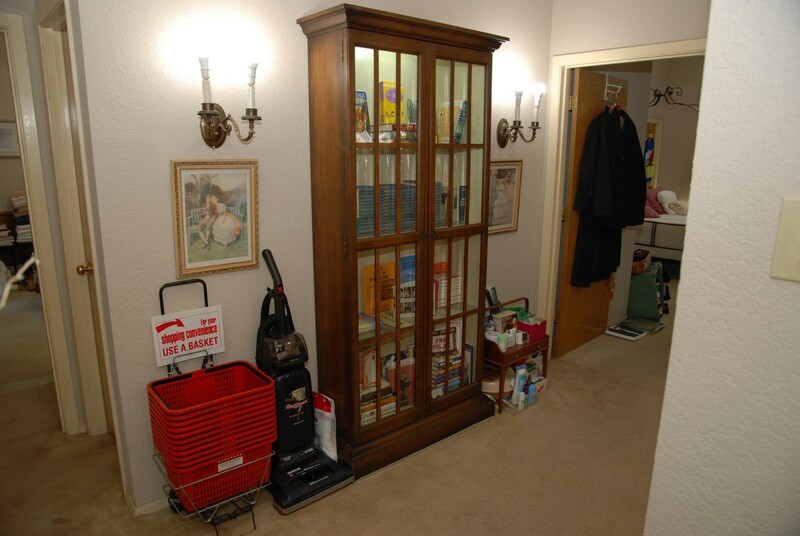 There is a large armoire with big double doors and storage shelves. Inside on one of the shelves there are two nice Samsung TVs. 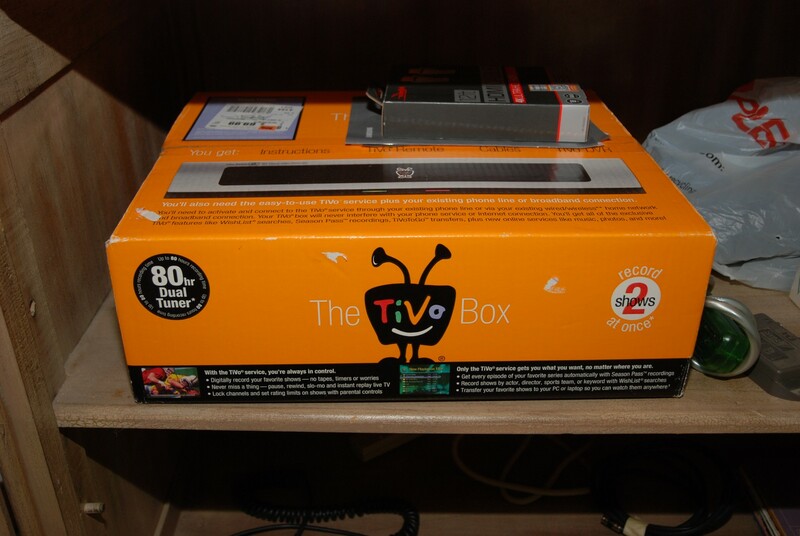 One is 49” and the smaller one is 24.” There is also an 80-Hr Tivo (new in box) with a dual tuner that can record 2 shows at once. We have a few CD’s and 33 RPM records. For those who like 80’s era items we have an original IBM key board from the early 80’s. If you like Victorian Chairs, we have 6 dining side chairs with a carved rose back and cloth seats. 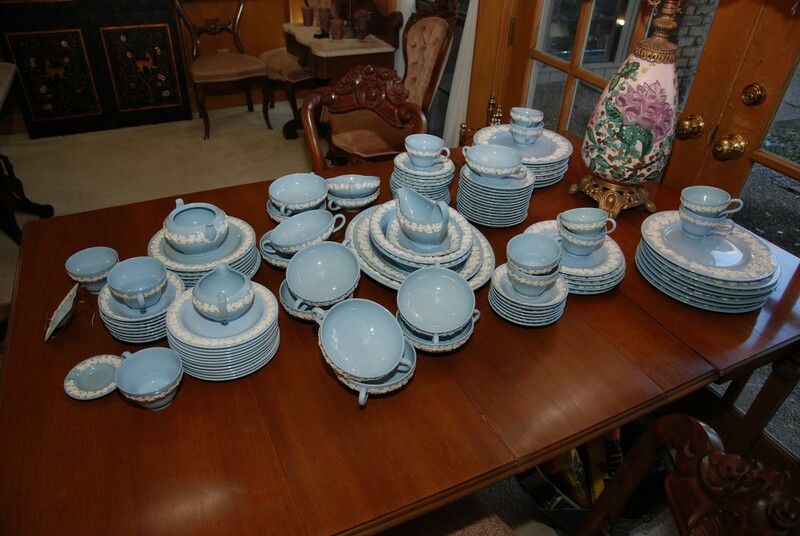 For a real treat we have Wedgewood of Etrunia and Barlaston Embossed Queens Ware made in England. 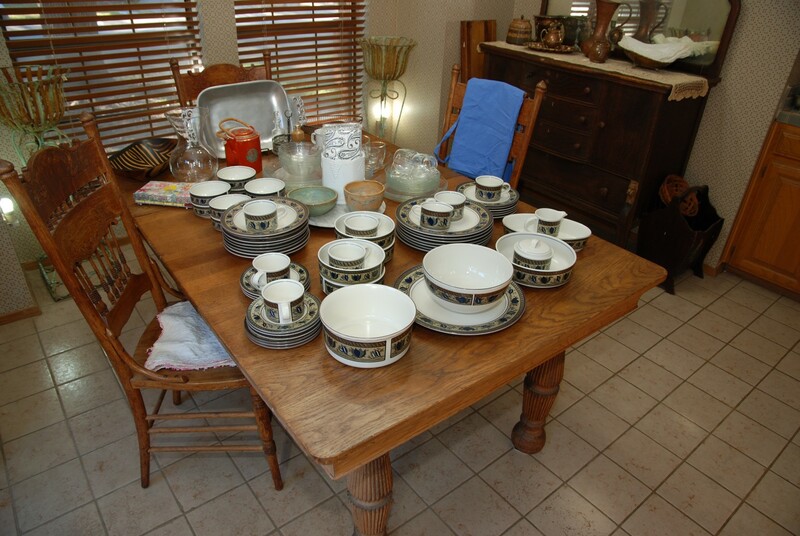 We have lots of different size plates and dishes. We will price separately. We also have a nice console table that has two leaves that can fold up into a small foot print. 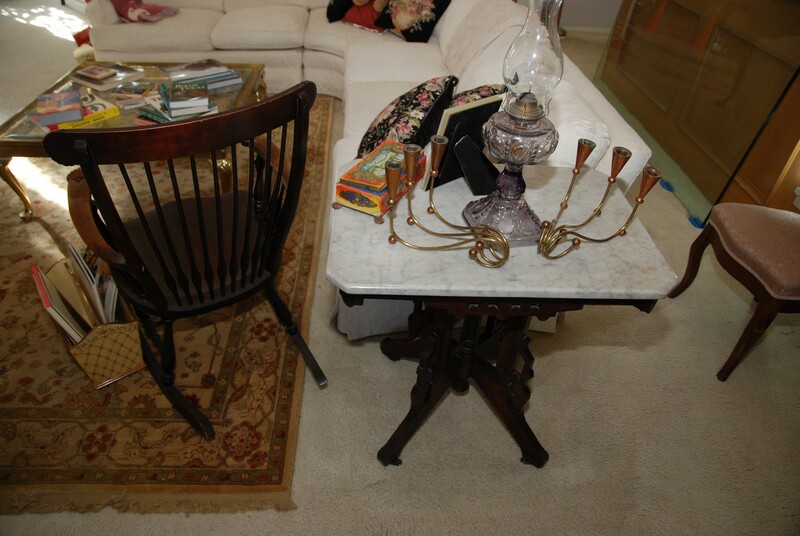 There is a large Victorian lamp with fringe shade (BNI) and we also have a nice side table with a cream marble top. There is also a two panel screen leaning up against the wall. 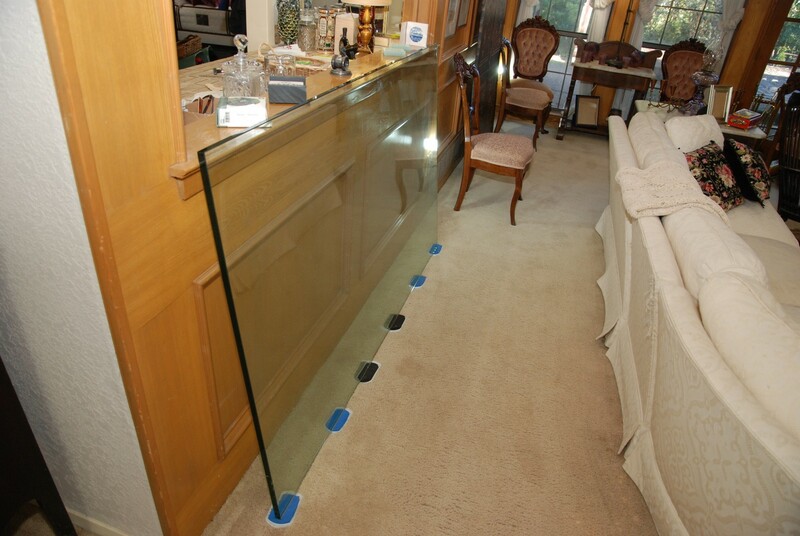 We also have a thick glass table top that is 42” x 72” and it is in perfect condition. 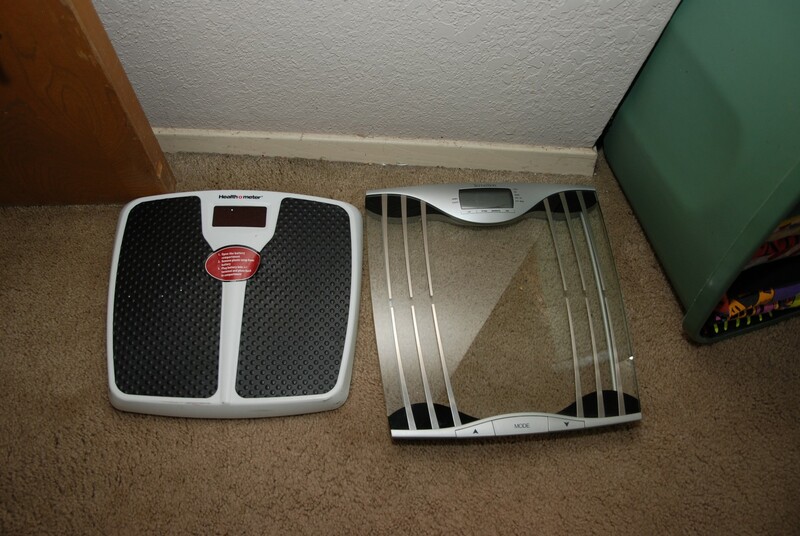 It’s about ¾” thick and weighs approximately 300 pounds. 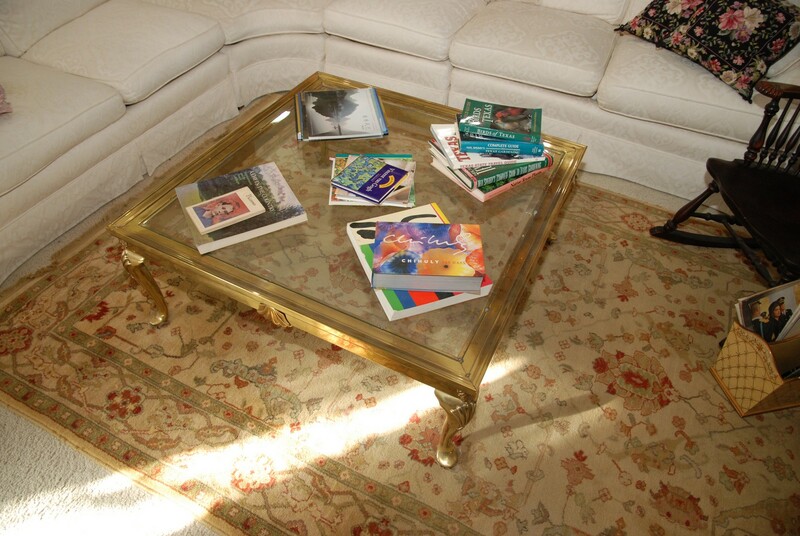 There is also a great carpet rocker in great condition and a solid brass square coffee table with beveled glass top. There are many interesting coffee table books and two paper or book holders. We also have a second fire place set in polished brass along with a polished brass wood holder. 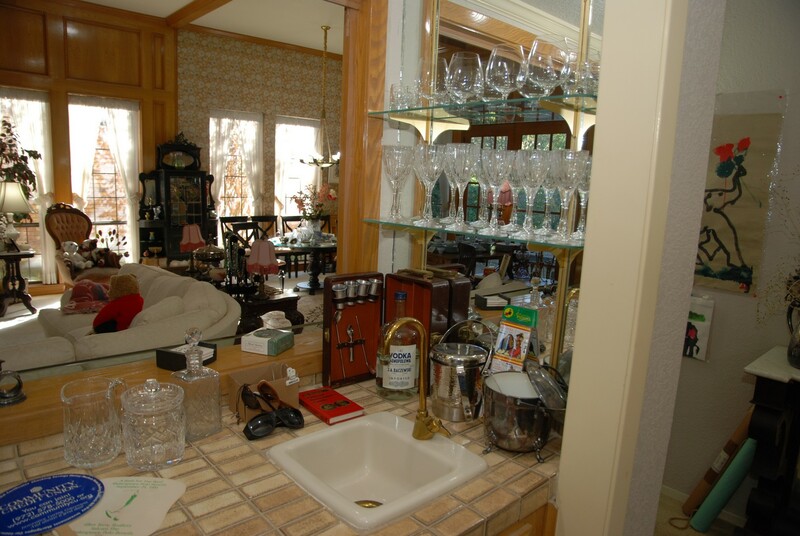 The bar area has two different styles of Waterford crystal along with another nice stemmed glass that is also crystal. We have some interesting coasters, other bar items, napkins and a nice lamp. 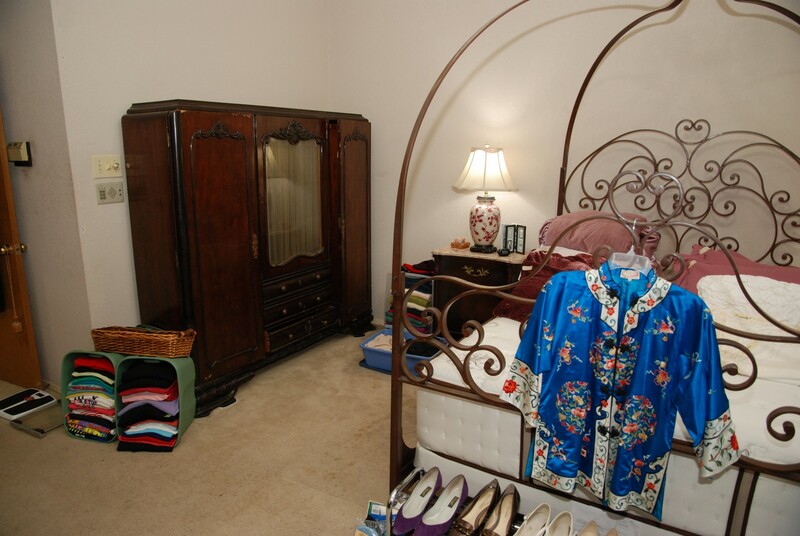 Master Bedroom / Boutique – features an awesome iron canopy bed. The headboard and foot board are iron with a beautiful scrolled pattern. It is an awesome find. Make sure to come early for this beauty. There is a very nice mattress and box spring. 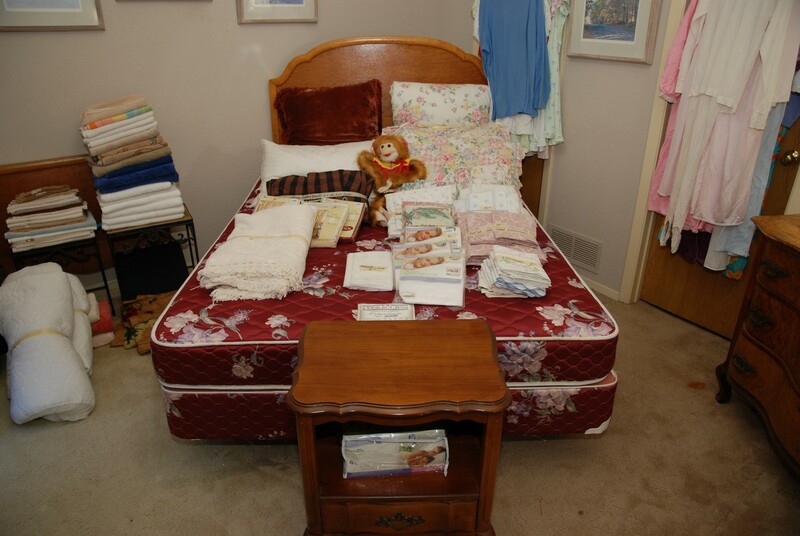 The mattress is a queen size Sterns and Foster ESTATE Paces Ferry Ultra Firm. We have two matching vintage night stands. 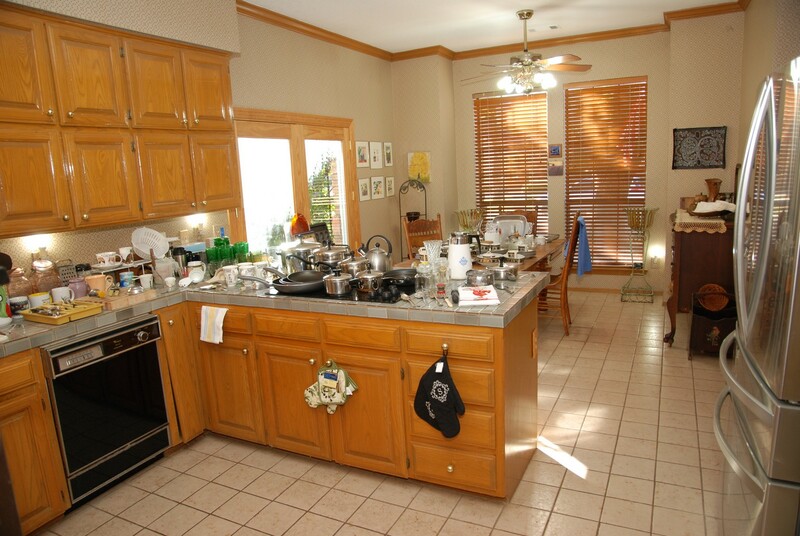 Each has a drawer and a large door with a shelf inside for storage. 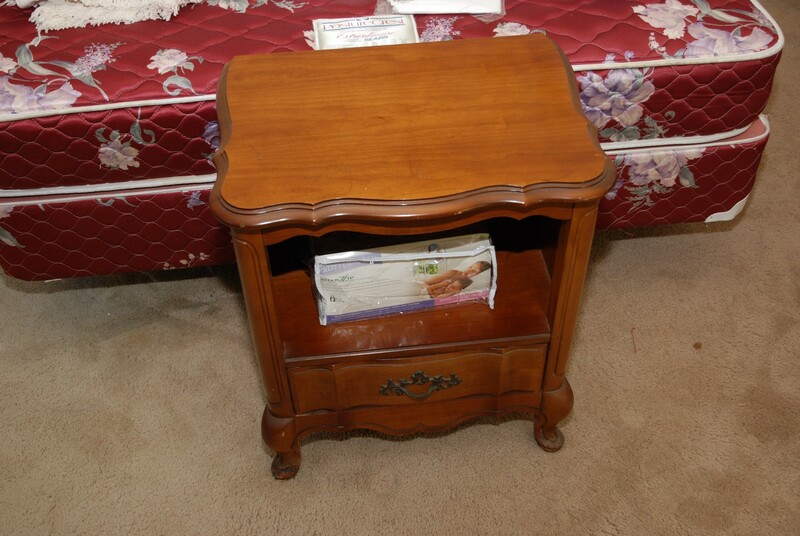 The front of each night stand is curved. Each night stand has a pink marble top. 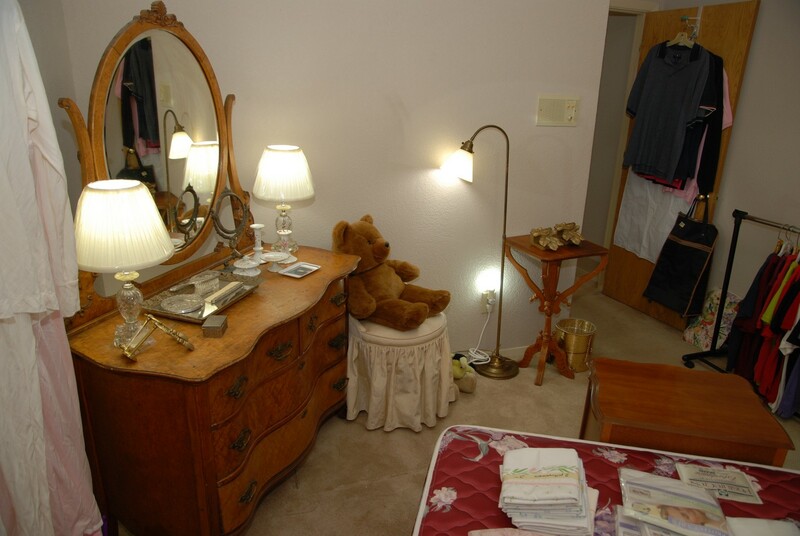 There is an Asian ginger style lamp with shade (BNI) on each night stand. The lamps are slightly different from each other. 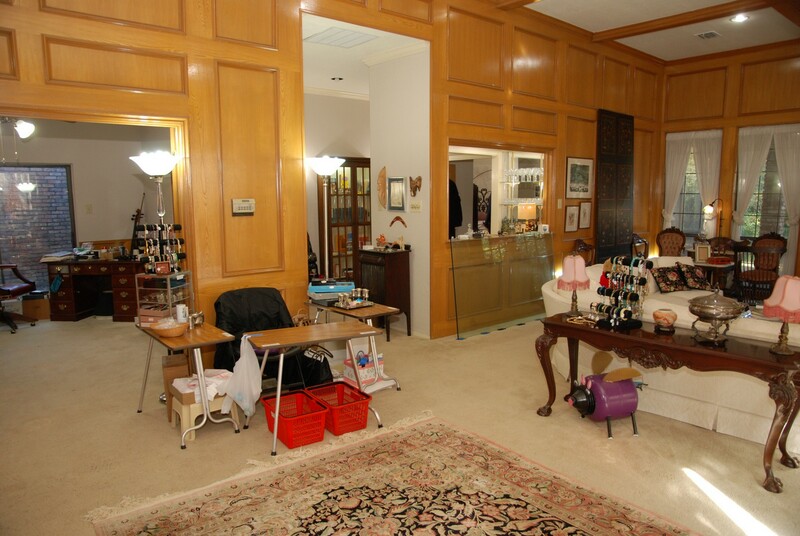 There is a large wall mirror in this room with a gold scroll style frame. 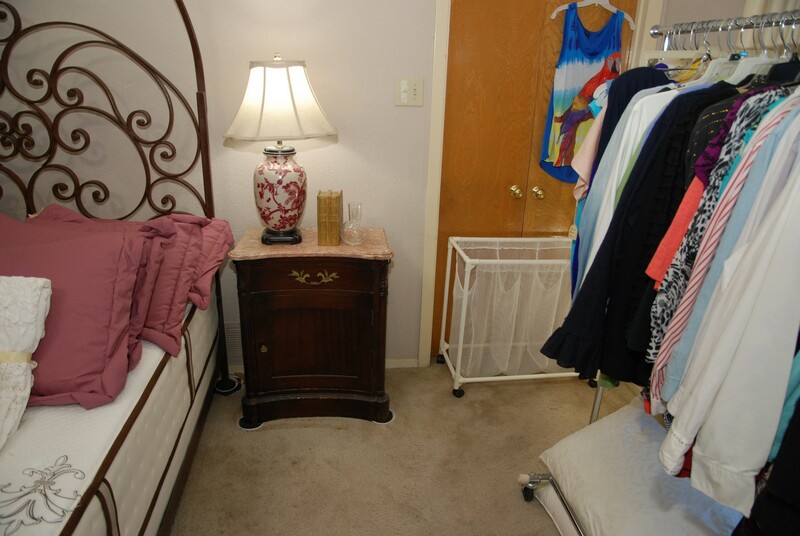 The triple dresser is very long and it has a beige marble top with nice edge on the front. We have two sets of hand mirrors and brushes along with a mirrored tray. 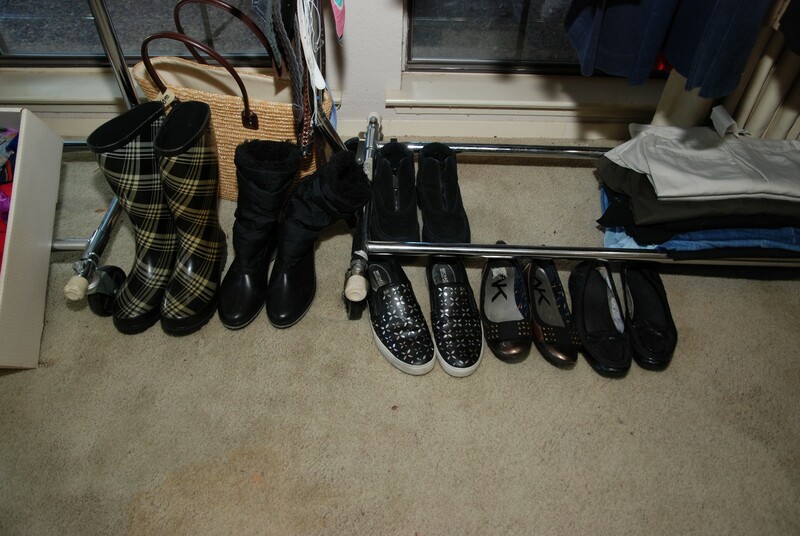 There are three racks of women’s clothing along with lots of nice shoes. 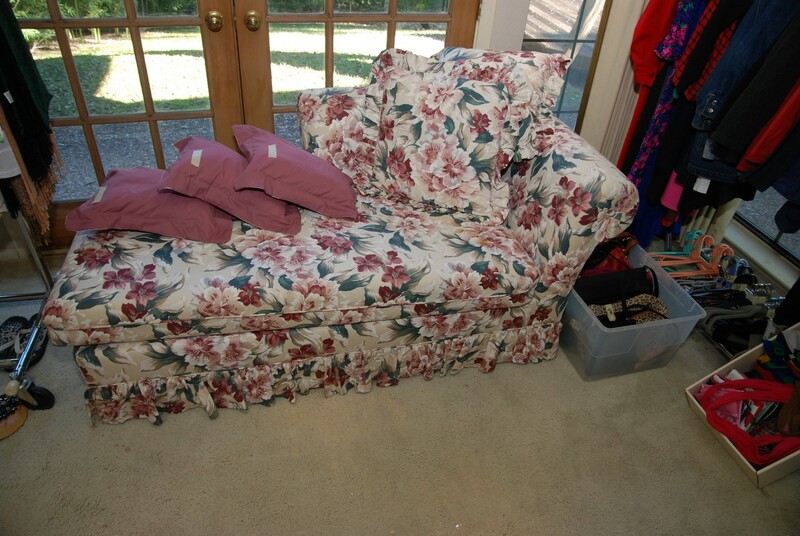 We have a floral Lounge chair/couch. 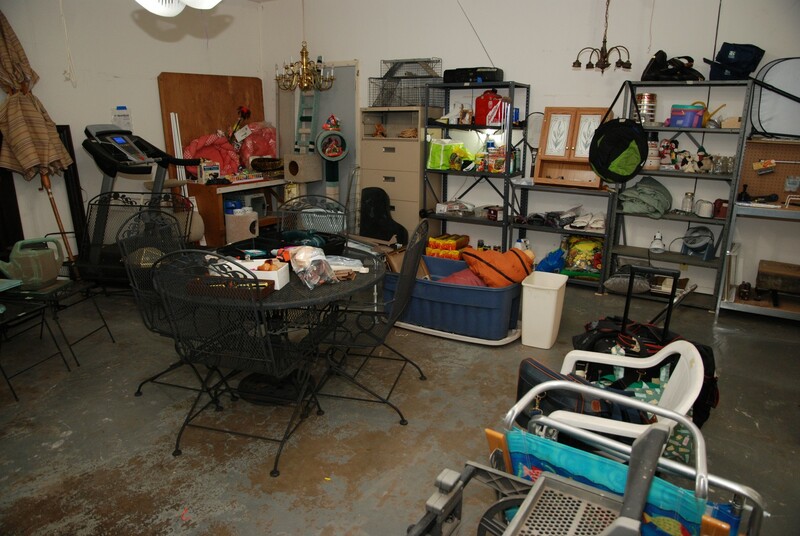 We have socks, scarves and shorts in bins and boxes staged in this room. 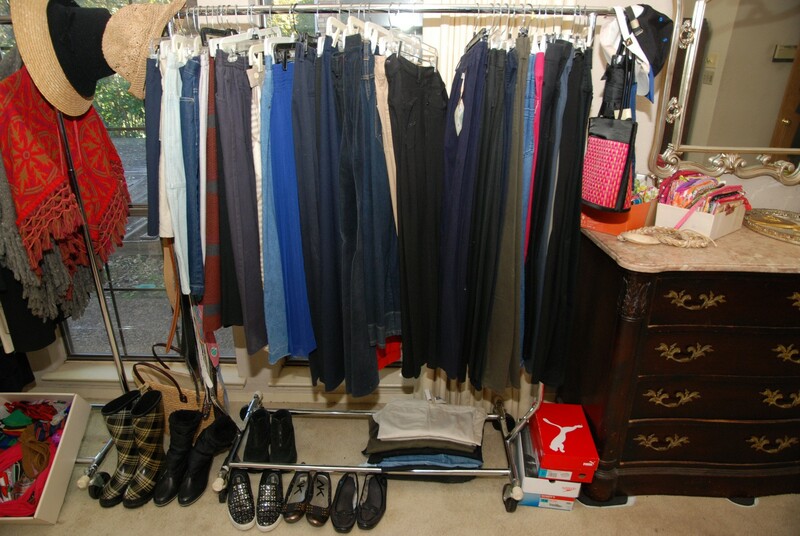 There is a wardrobe closet with double locking doors and a large single glass door in the center. It also has three bottom drawers in the middle section. This piece is very large and heavy, and the wood for its age is in good condition. 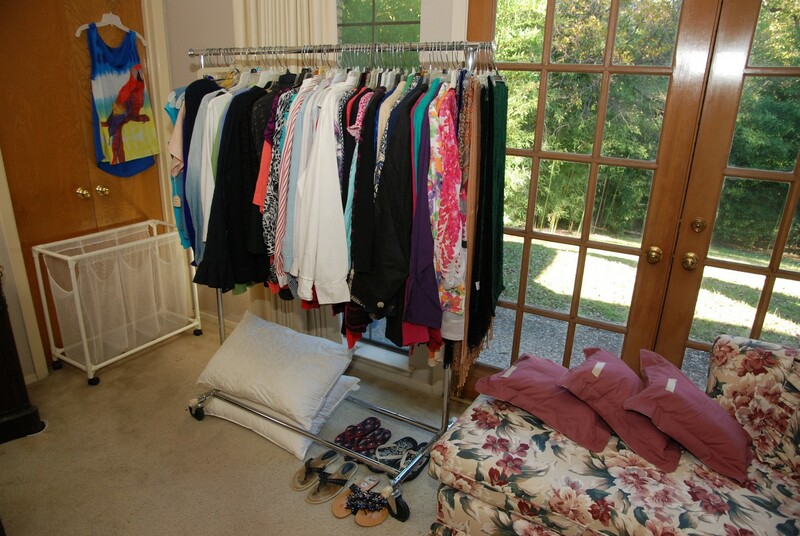 We have lots of little item’s staged around the room, so make sure to look carefully. Guest Bedroom / Hall – features an antique mahogany aesthetic Art Nouveau style étagère display cabinet with curved glass and glass shelves. We have this cabinet full of interesting books. 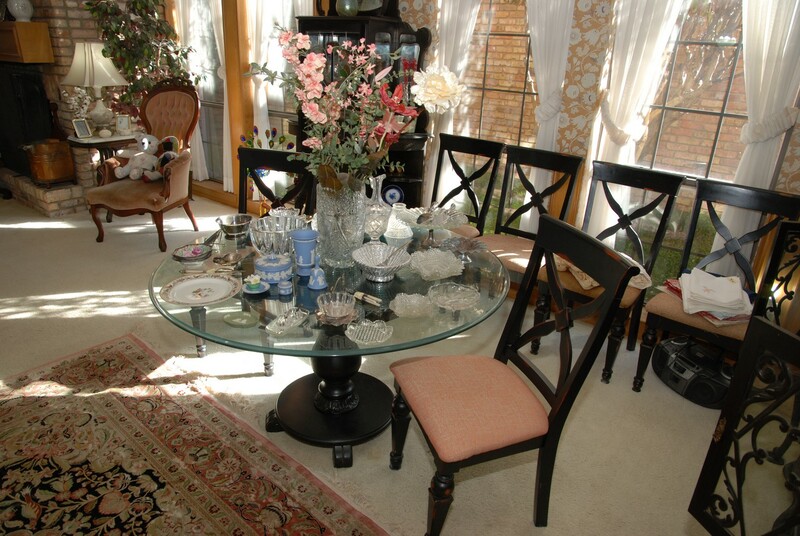 You can use it for displaying your collectables or in the dining room for china and crystal. 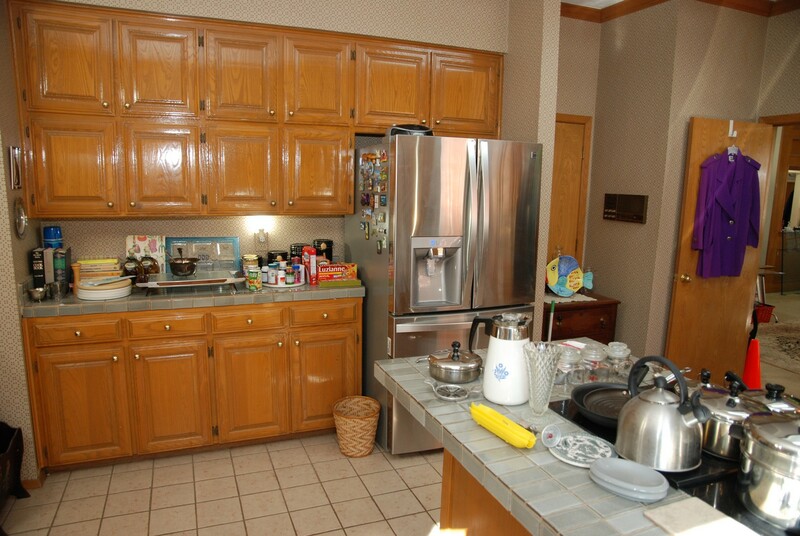 There is a nice single drawer cabinet that has a large single door for storage on the bottom. 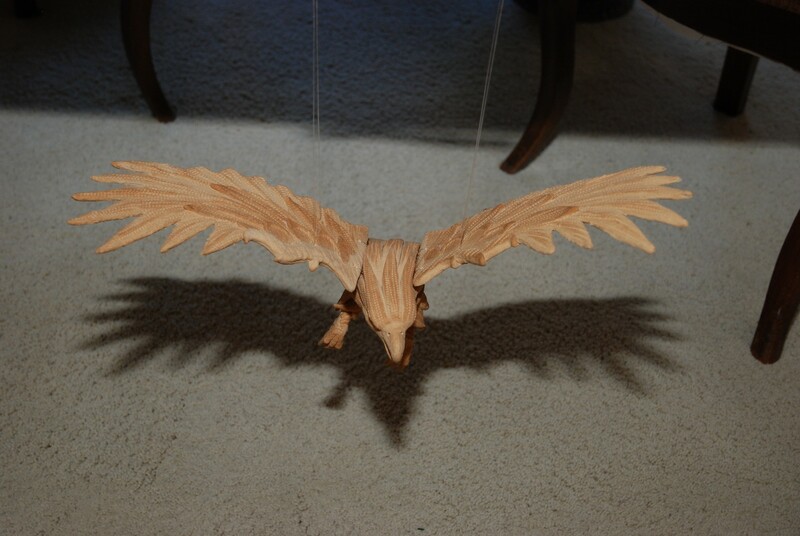 This is a vintage wood piece and it is in great condition. 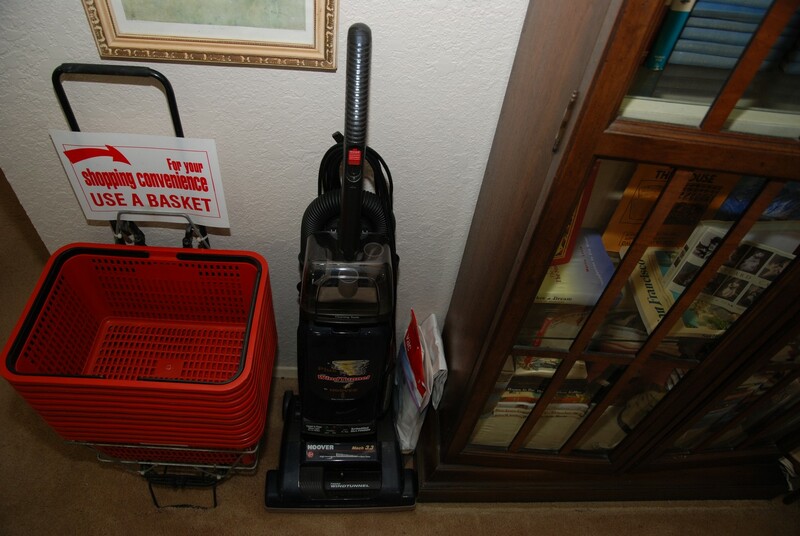 We have a Hoover Plus Whirlwind Vac (like new) with supplies, and we also have a Bissell Easy Vac with Power Brush and edge cleaners. We have lots of interesting art on the walls. There is a great large Oak Entry table with an off-white marble top. This piece has scrolls on each side. It is an awesome find. 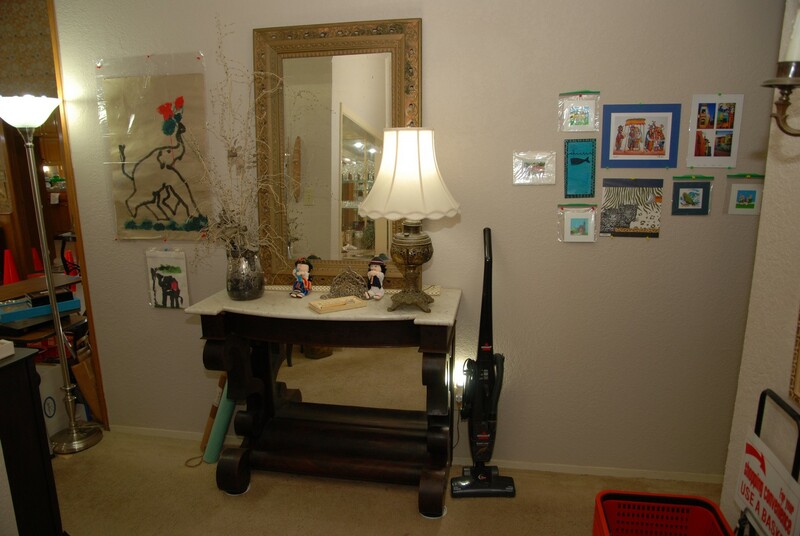 We also have a nice Framed Beveled mirror in awesome condition. The lamp is antique bronze with shade (BNI). We have a Birds Eye Maple Headboard and Footboard. 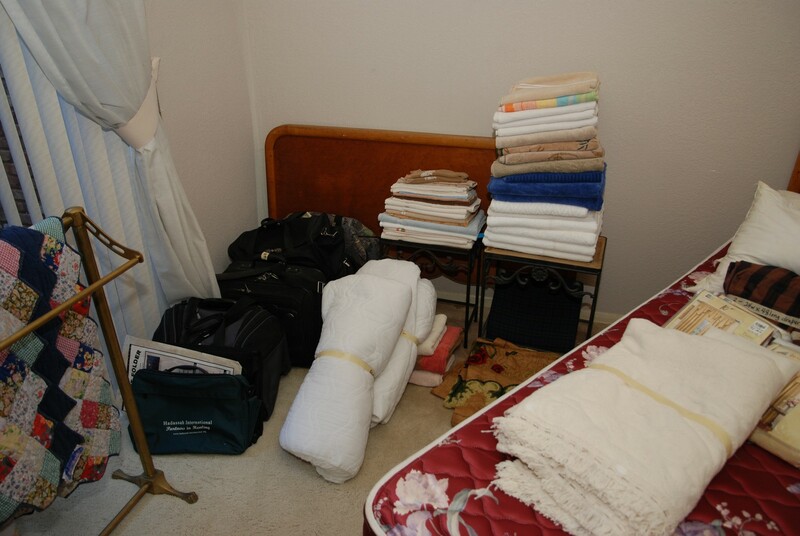 We have a nice Queen Mattress and Box Spring: a Sealy Posture Crest Extraordinaire by Sears. 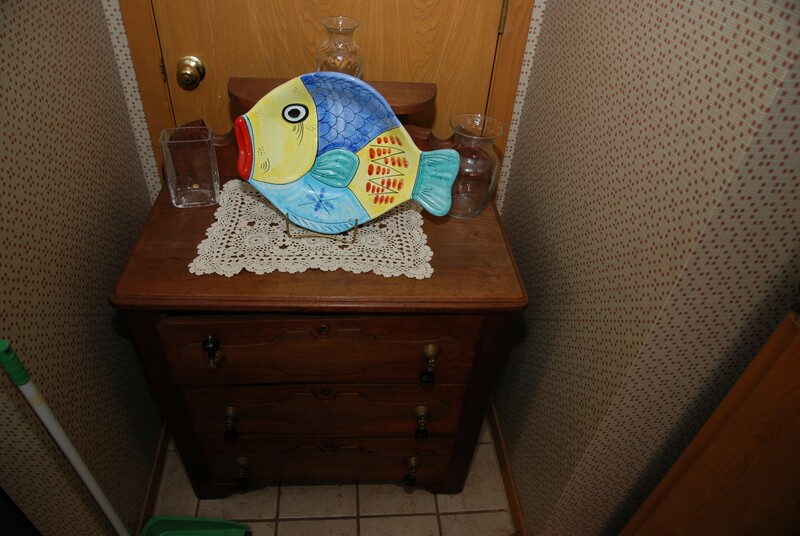 We also have a Birdseye Maple Dresser with Round attached Mirror. 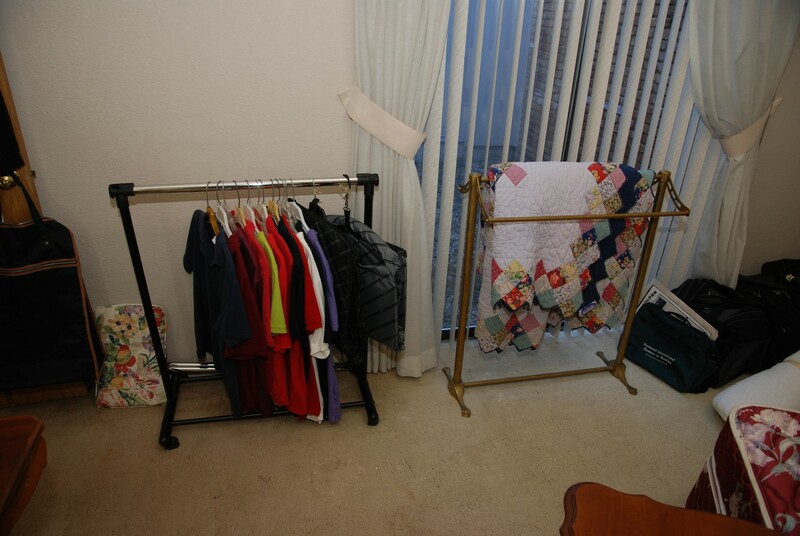 There is a solid brass quilt rack and two small accent tables. 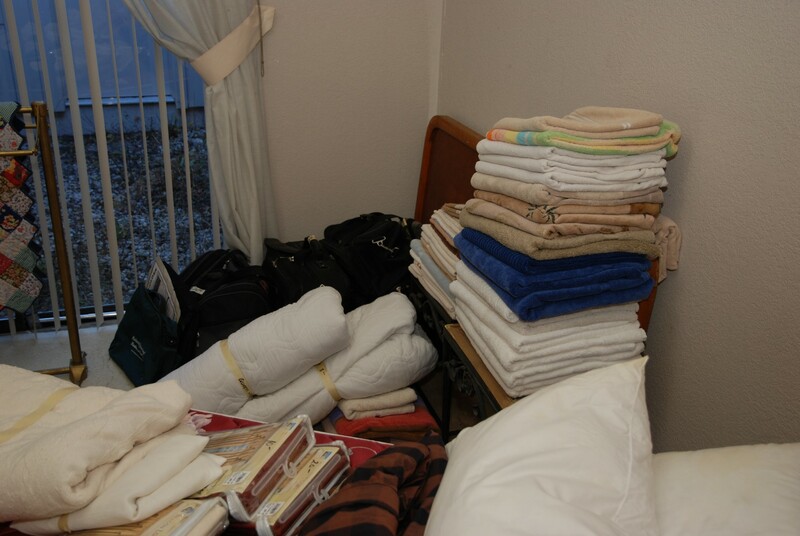 There are bath towels and some bedding. We have some nice pictures on the walls. 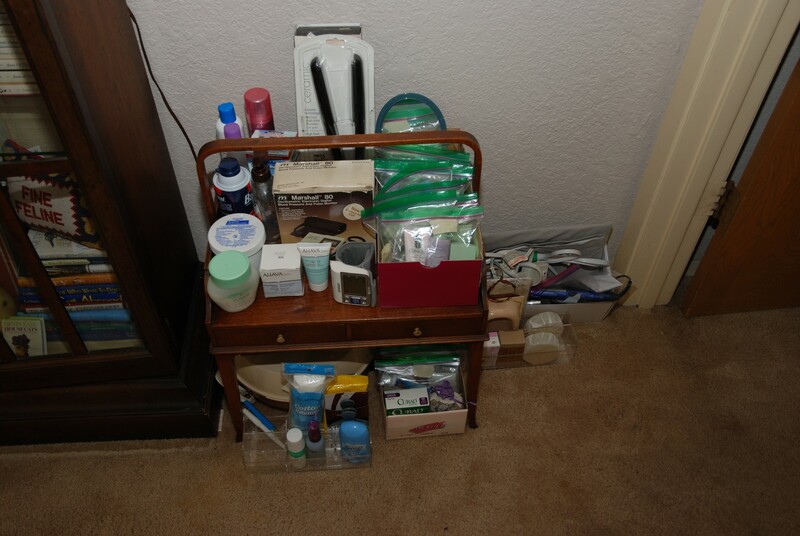 We have an open night stand with a single drawer. 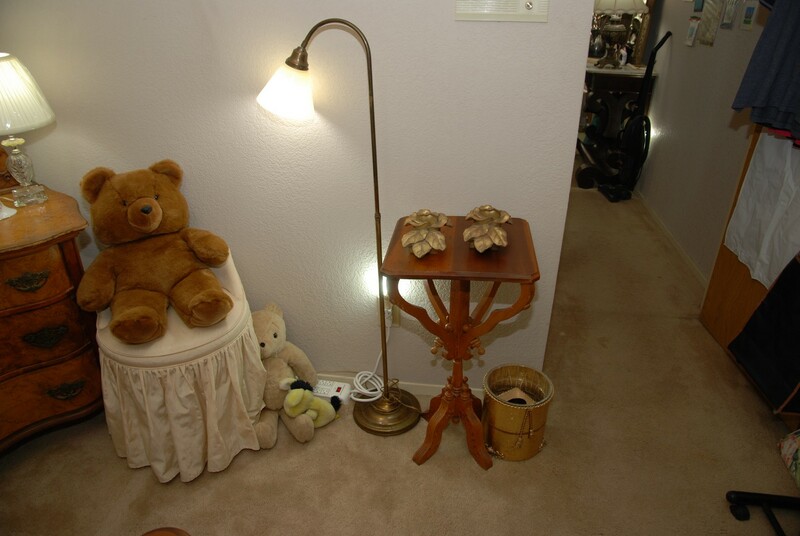 There are two matching table lamps with shades (BNI). 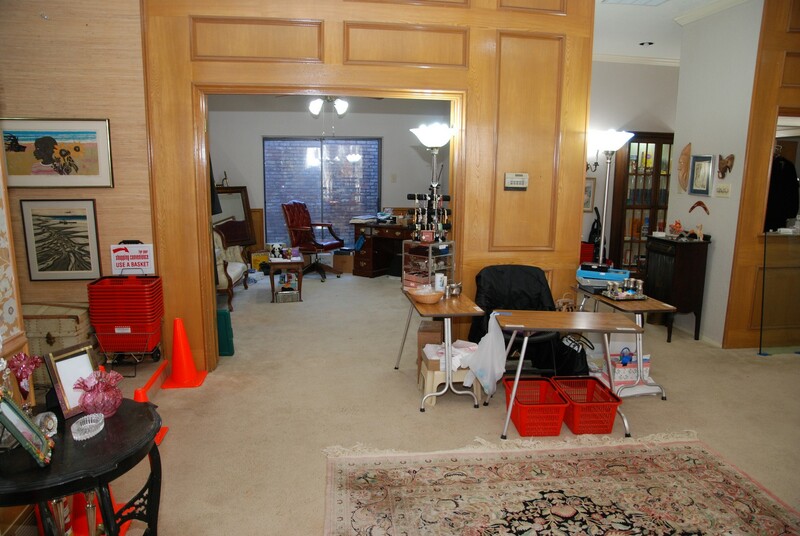 We have a nice make-up chair and a floor lamp (BNI). 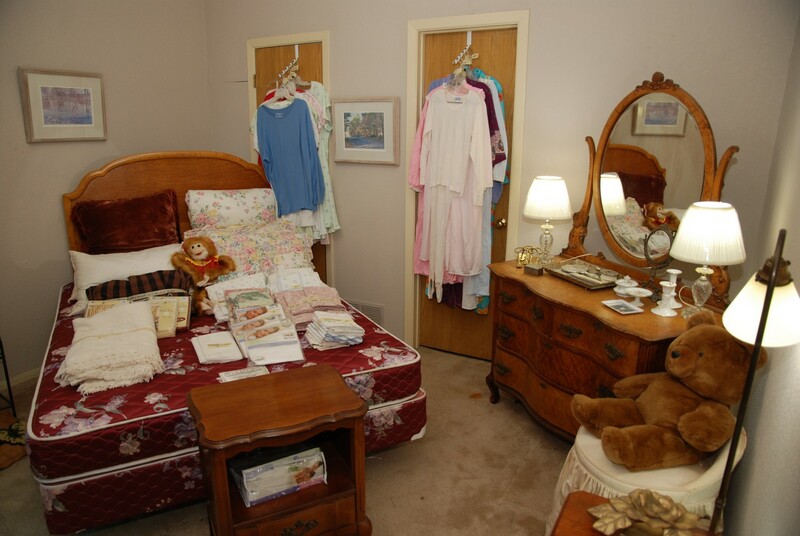 There is a large teddy bear and some nightgowns and pajamas. 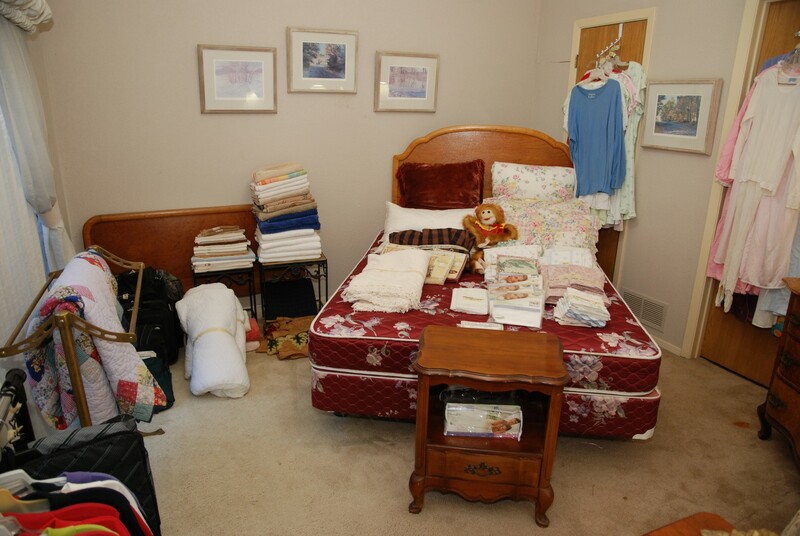 This room also has some suitcases and travel bags. 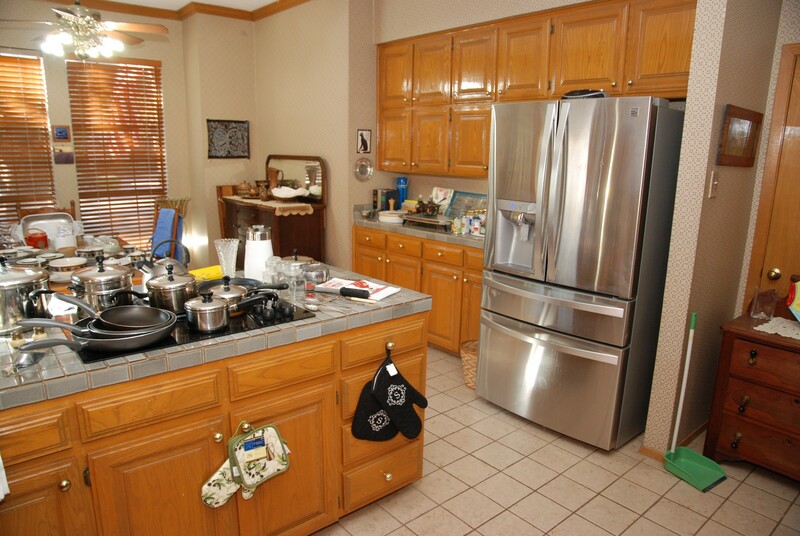 Kitchen / Eating Area – features a very nice wash table with nice drawer pulls. This piece is solid. We have a nice fish plate and a crochet doily. 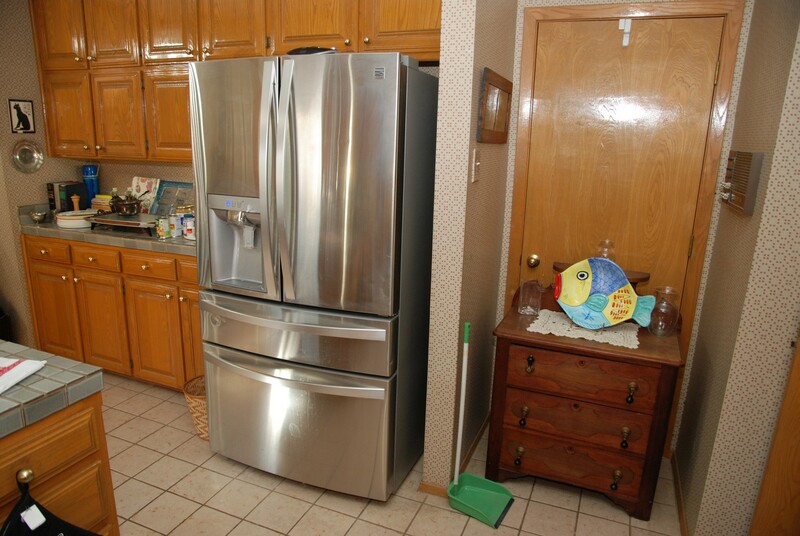 We have a stainless Kenmore Elite four door finger print resistant Fridge/Freezer just waiting for its new owner. The middle drawer has some nice settings that you can select like; Meat / Seafood, Cold Drinks, Deli Snacks, Chilled Wine and Lock. The “in- door” water and ice dispenser has buttons for water, ice, cubs and crushed ice. 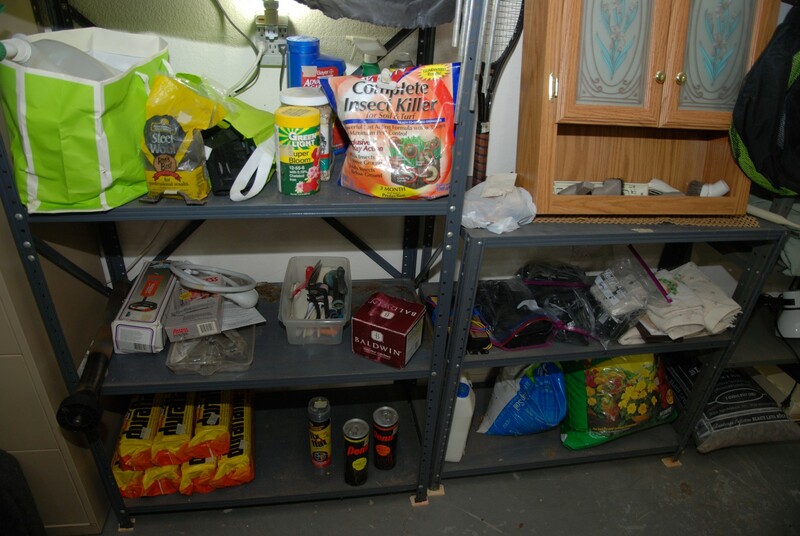 There are some canned goods and spices as well as multiple Lazy Susans, trays and cookbooks. 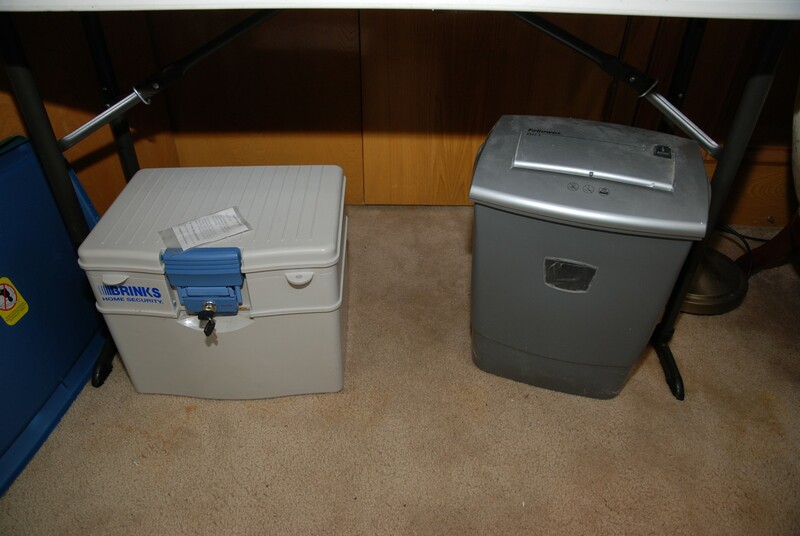 We have an electric warming tray and a nice canister set. 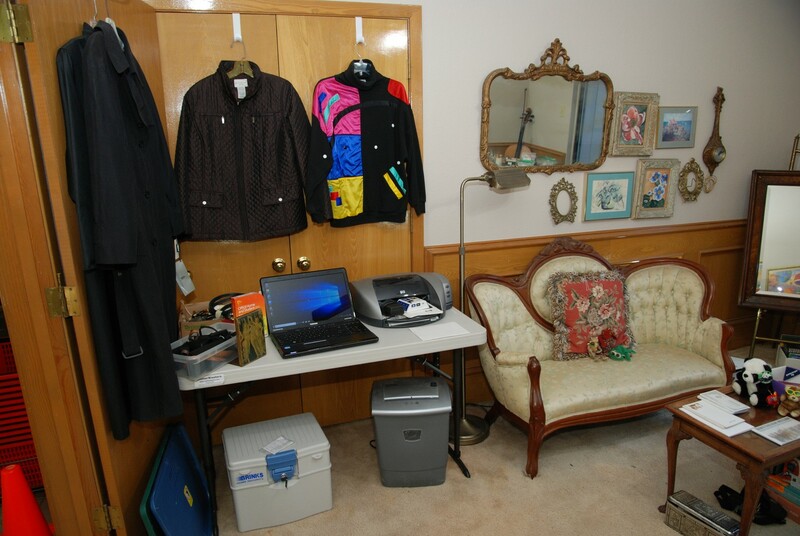 There is a nice Claw Foot Mirrored Back Buffet that needs some tender loving care, and a vintage magazine rack. 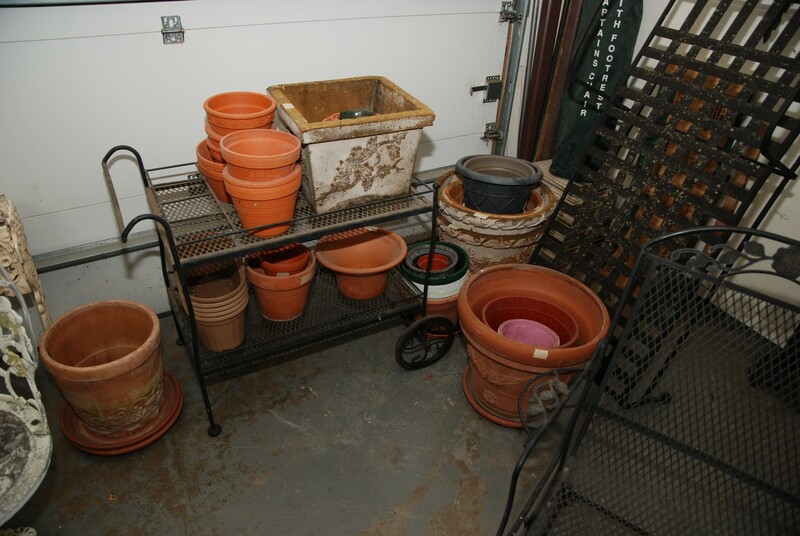 We have two nice metal plant stands along with a nice double plant stand in the corner. The rectangle table is Oak with two leaves and this table has some awesome legs. There are some interesting pictures on the walls. 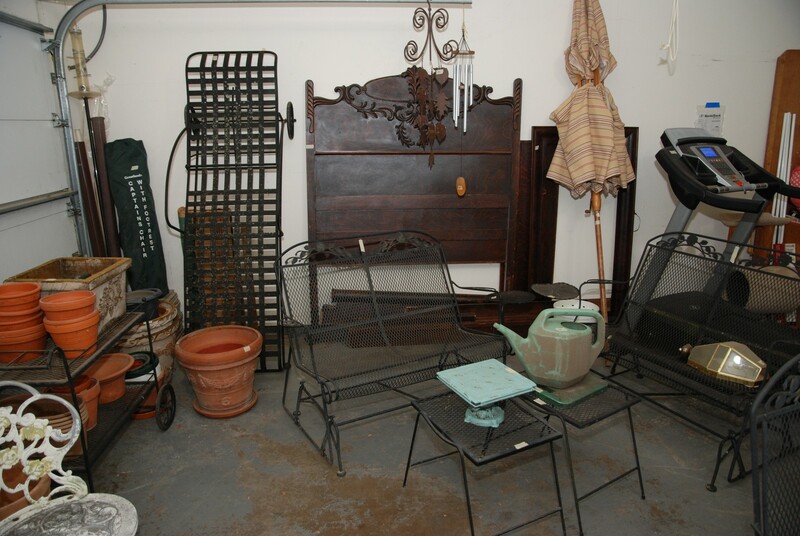 There are three vintage Oak chairs and a green metal plant holder with two shelves. 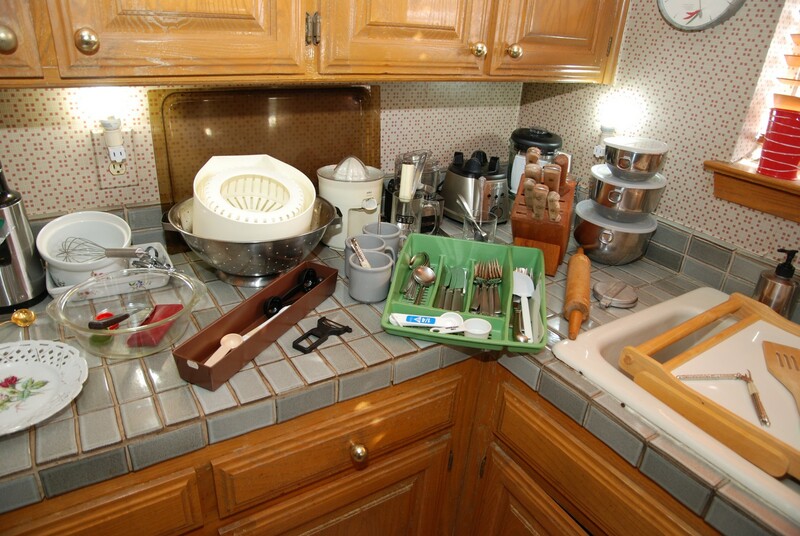 We have nice “new” baking trays, cake and loaf pans. 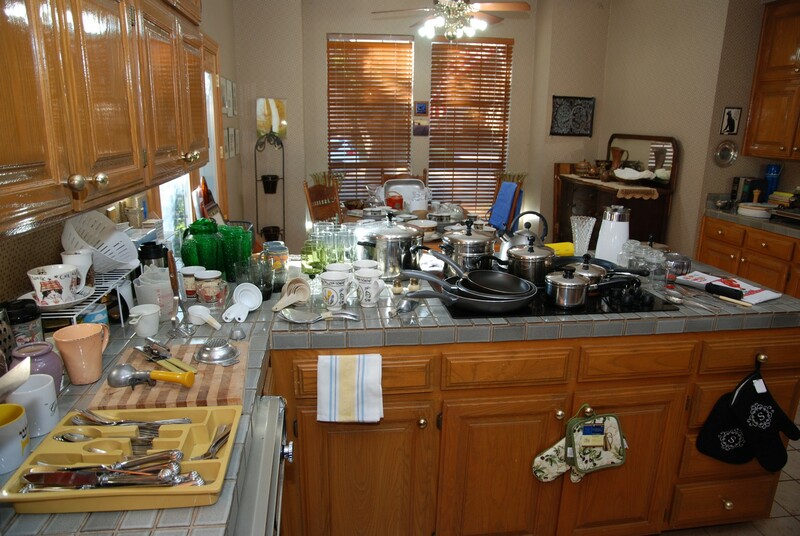 There are some great pots and pans along with several fry pans. We have nice glasses and a green pitcher with glasses to match. 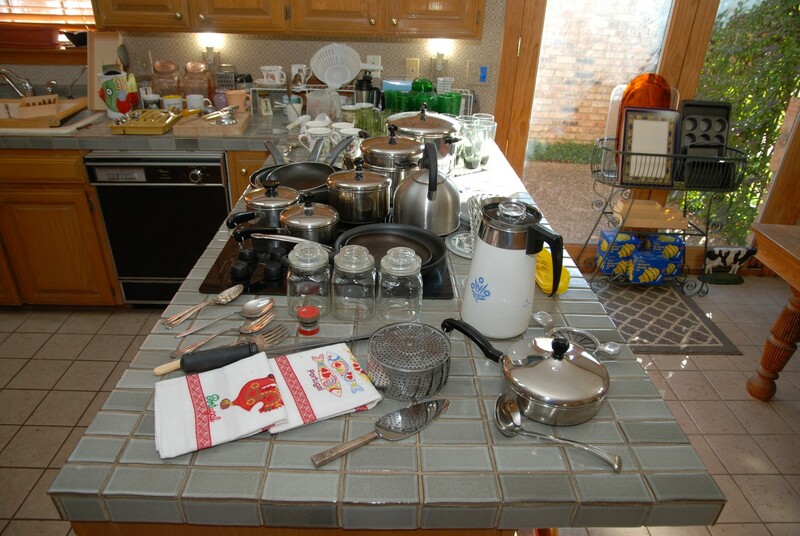 We have a tea pot, sauce pans and double broiler along with other meat pans. We have a small box of plastic storage containers. 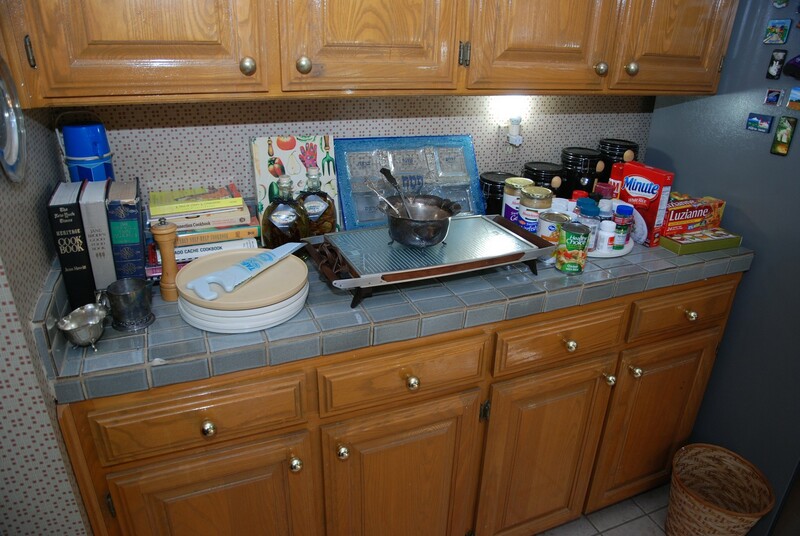 We have a Mikasa Ultra Ceram Bake and Serve set of dishes. They go from oven to fridge to table. We have some interesting magnets on the left side of the fridge/freezer. 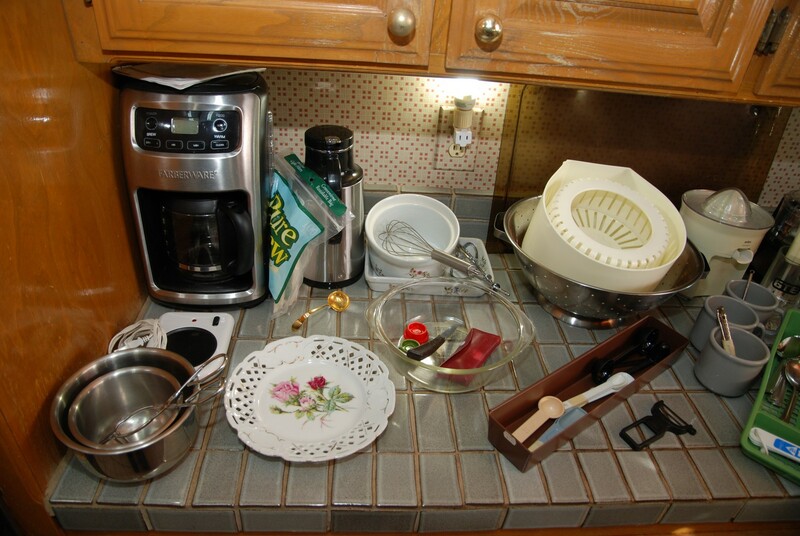 There is also a nice Faberware Coffee Maker, a small Cuisinart electric chopper and a Cuisinart Blender; both appear to be new. There is also a Braun electric juicer. 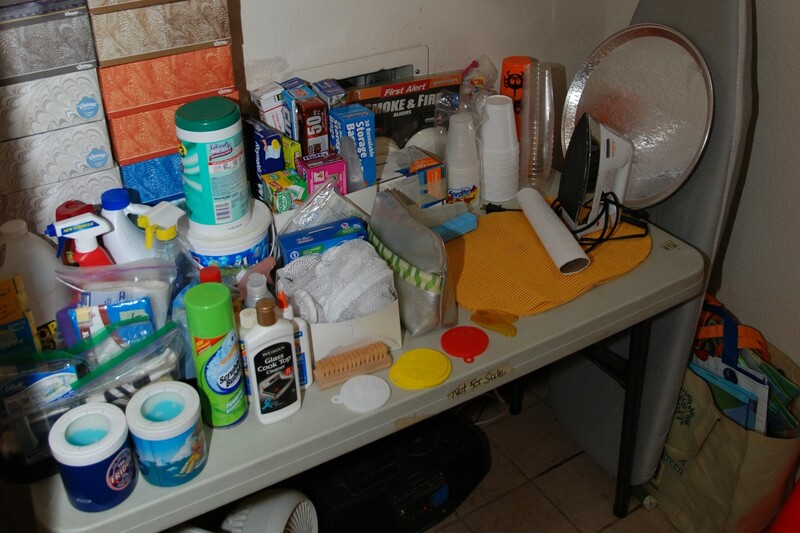 There are multiple bowls and utensils, cups and flatware. 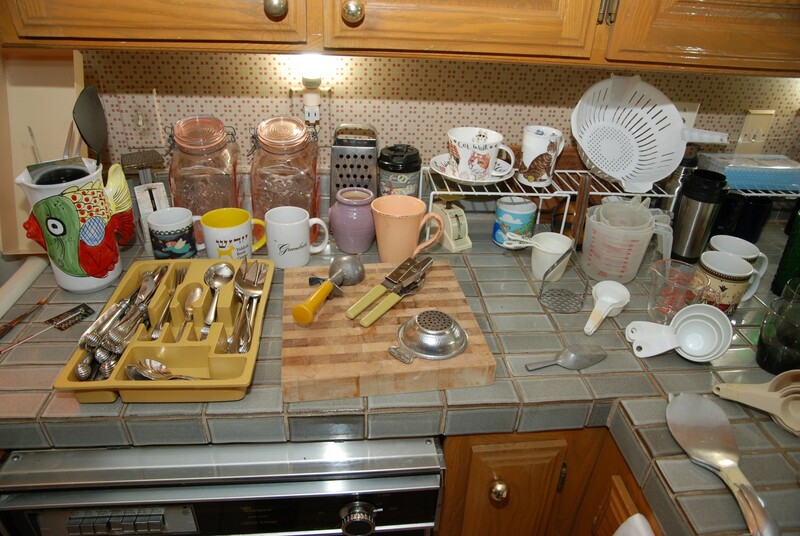 We have canning jars and interesting cups along with dish racks and measuring items. 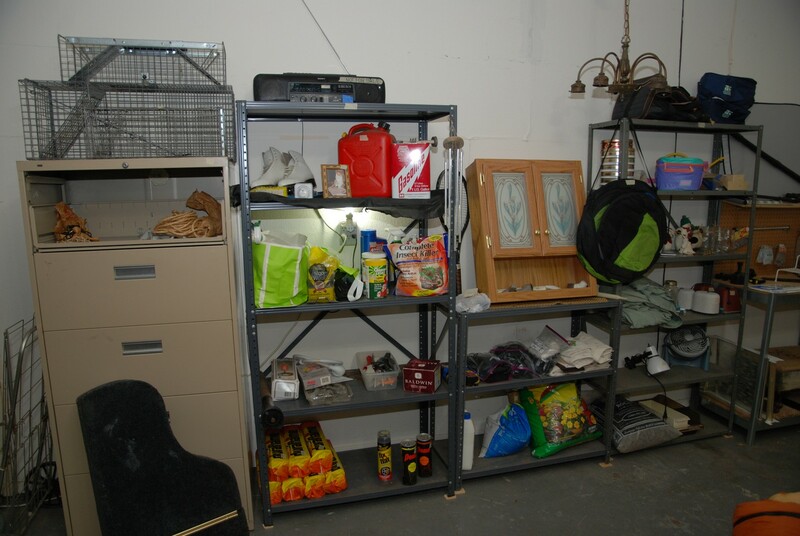 Large Double Garage / Utility Room – features lots of cleaning items along with paper bags and wrapping paper for food storage. There is an ironing board with cover. 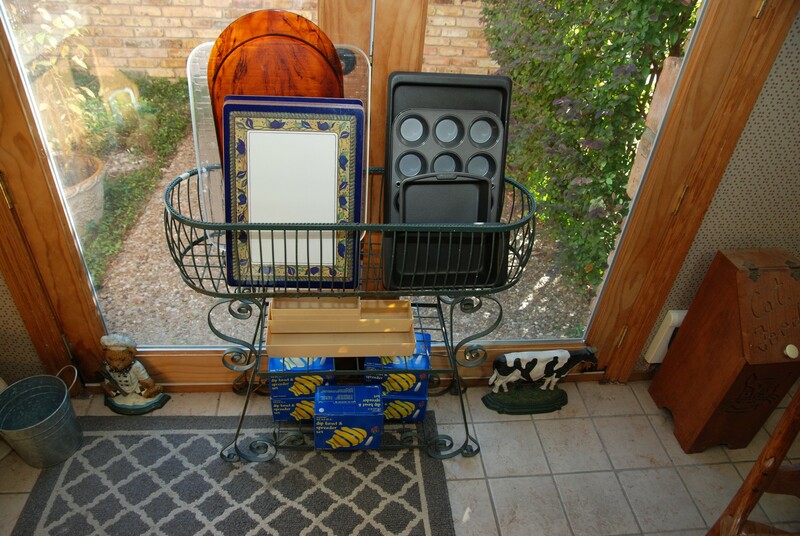 There are metal shelves for sale along with canning jars, some Christmas items, a footstool, vintage light fixtures, and a nice new bathroom cabinet. 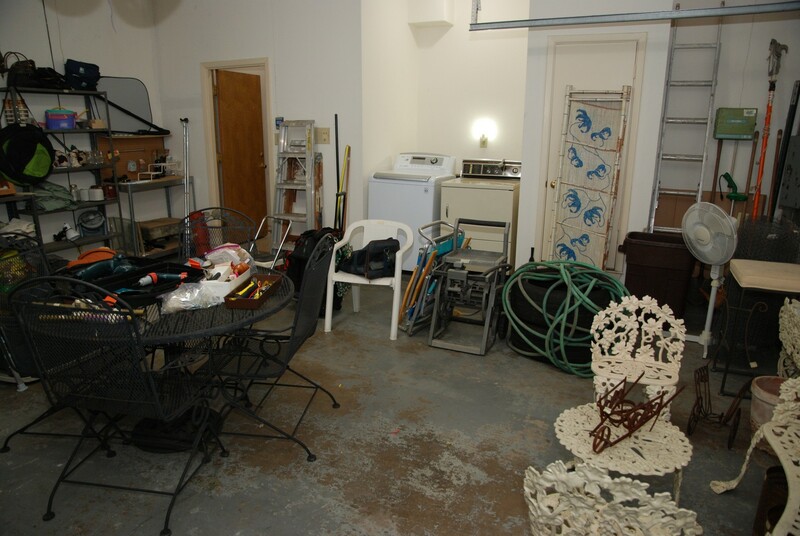 We have some lawn and garden items. 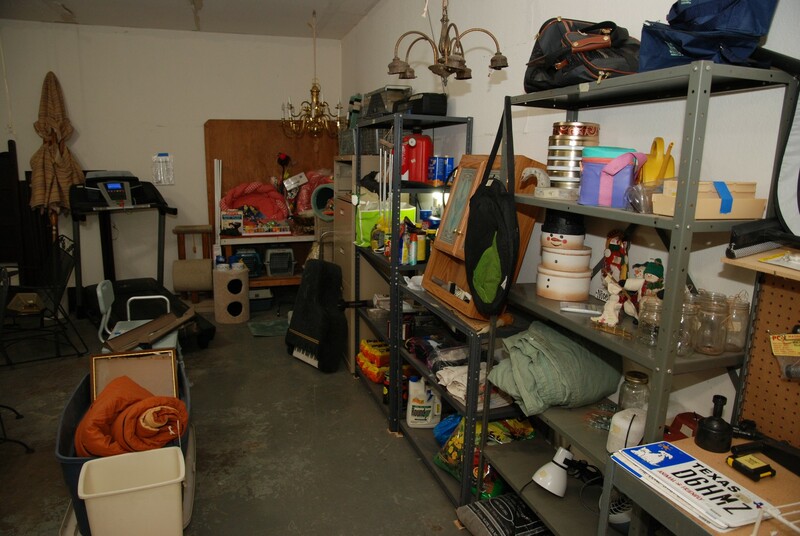 There are several sets of vintage phones, canvas bags, and a tennis racket. There are some Dura Flame logs (burn for 4 hours each). 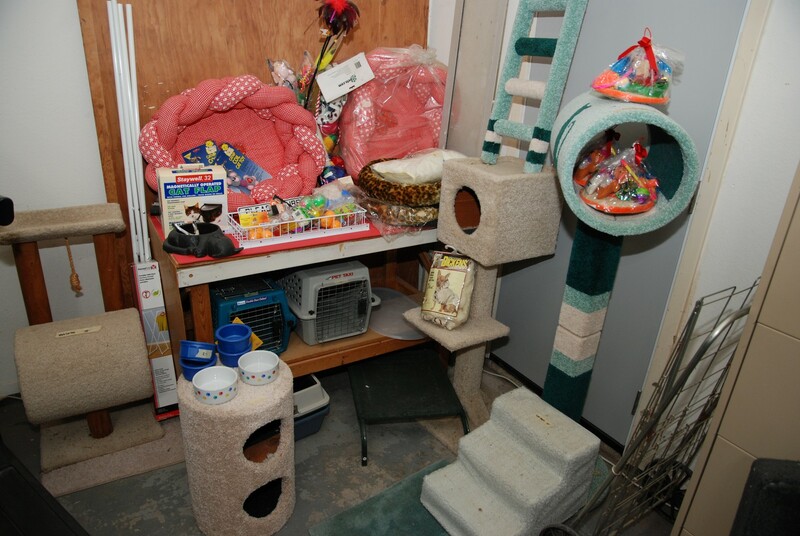 There are different sizes of live traps for small animals and an entire corner dedicated to cat/pet items. 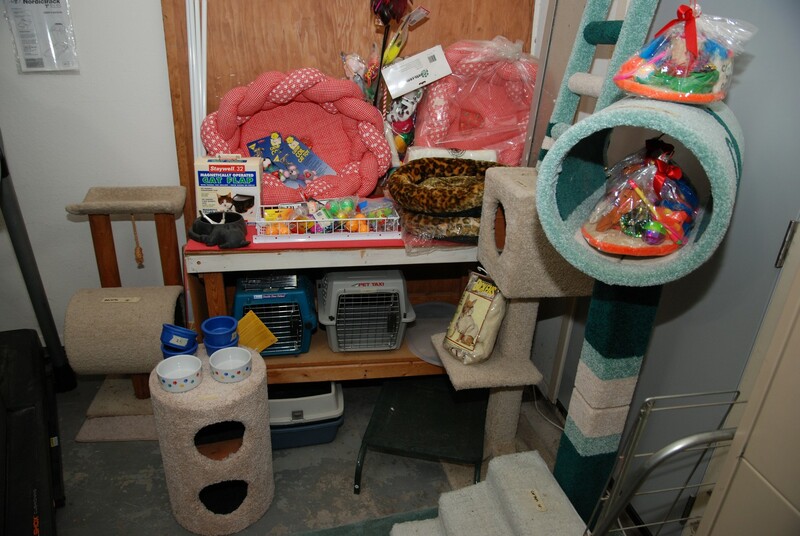 We have climbers, toys, bowls, beds, and even some food. 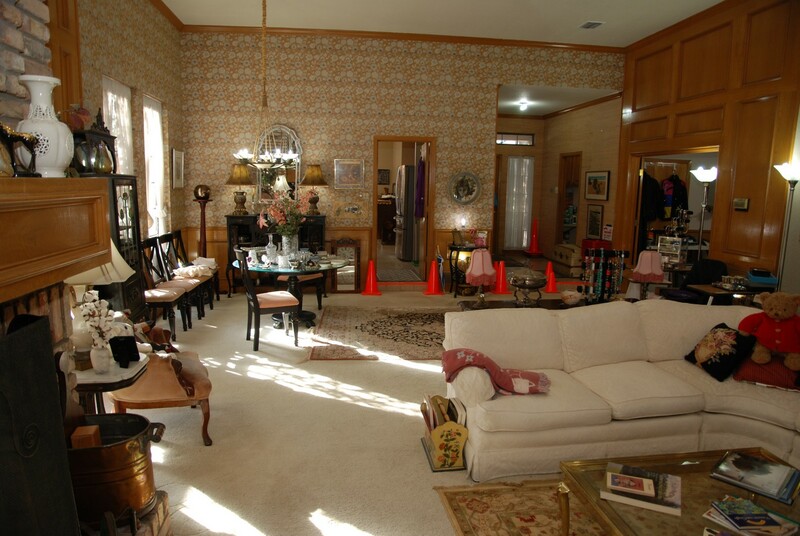 There is also a brass chandelier. 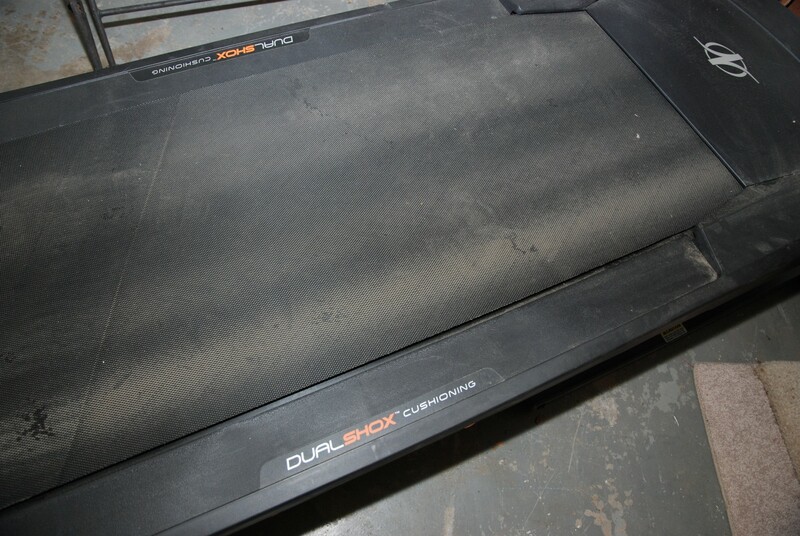 There is a great NordicTrack electric Tread Mill with Dura-Shox Cushioning. 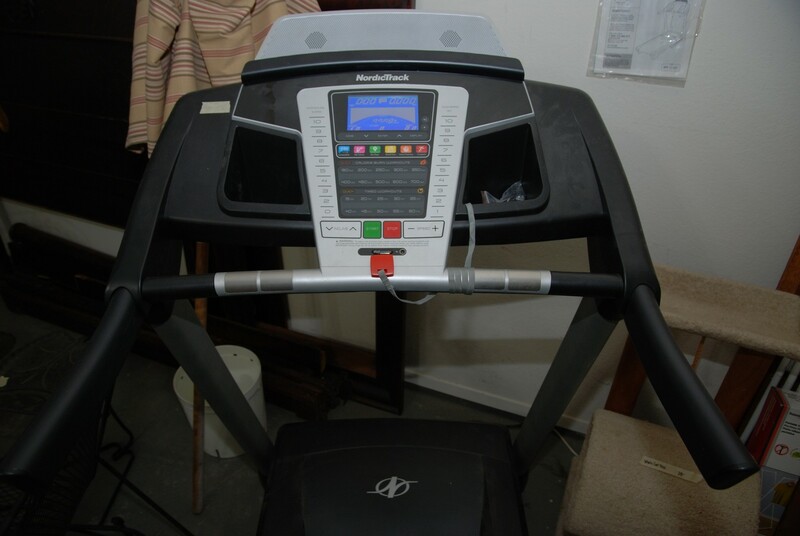 It’s in excellent condition, and it’s even got speakers that are iPod compatible. 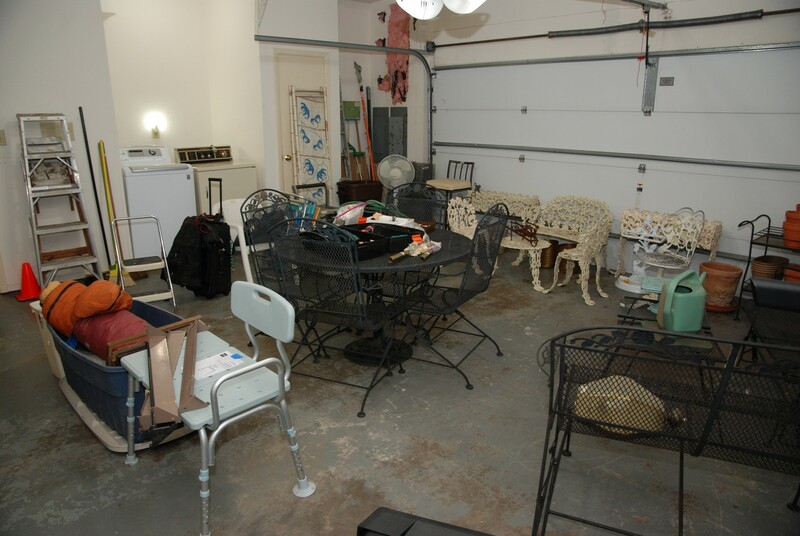 There is a double shower chair and a Black Wrought Iron round patio table with four spring chairs. 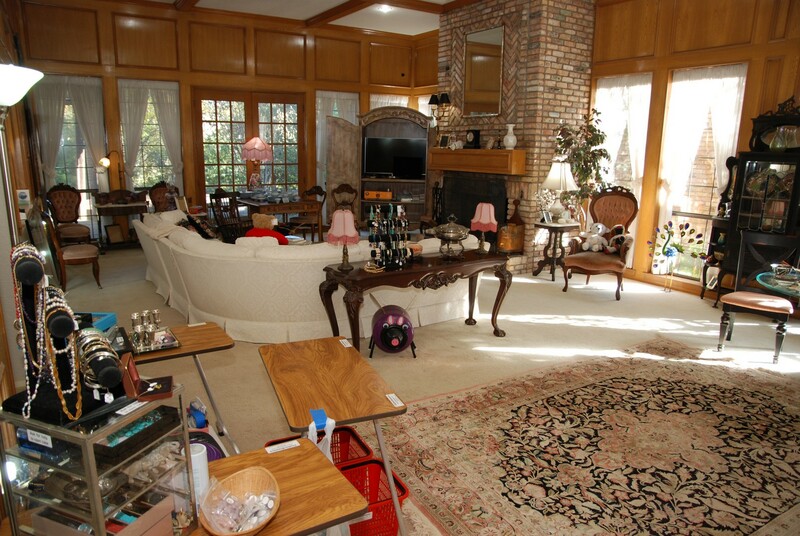 There is also two black wrought iron gliders and a black wrought iron lounge recliner. 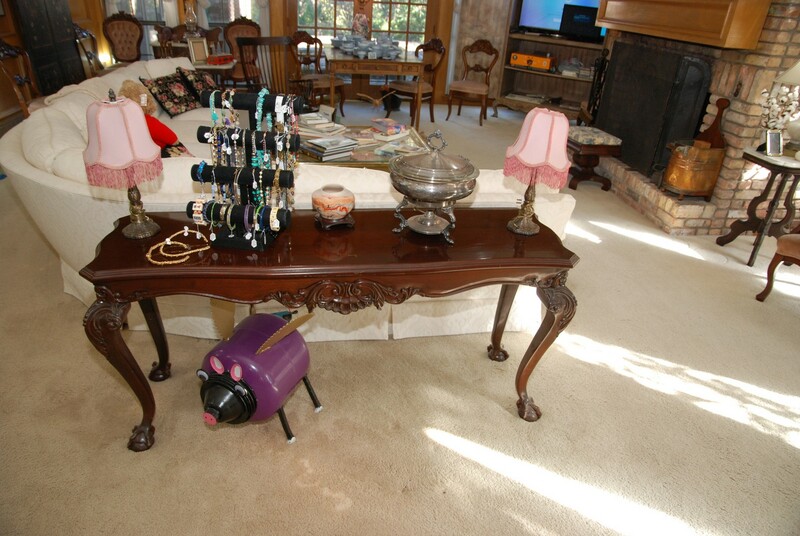 There are also two black wrought iron small side tables and a double flower cart. 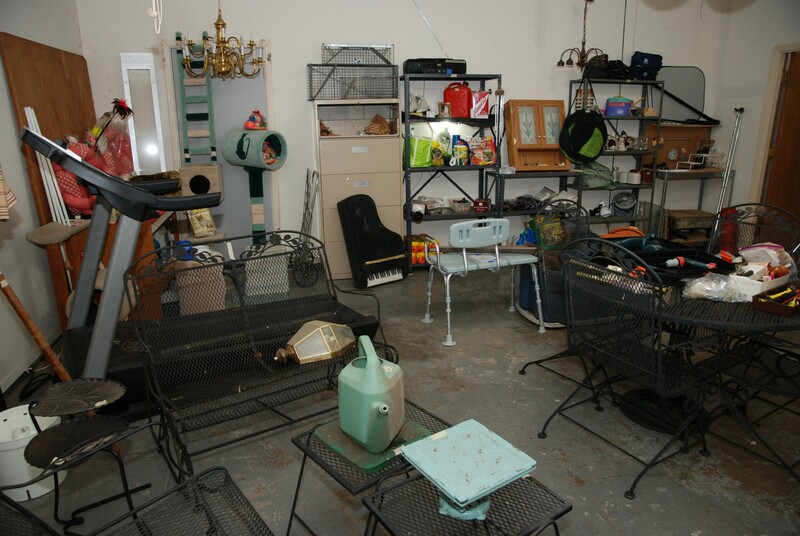 We also have a patio umbrella and black umbrella stand. 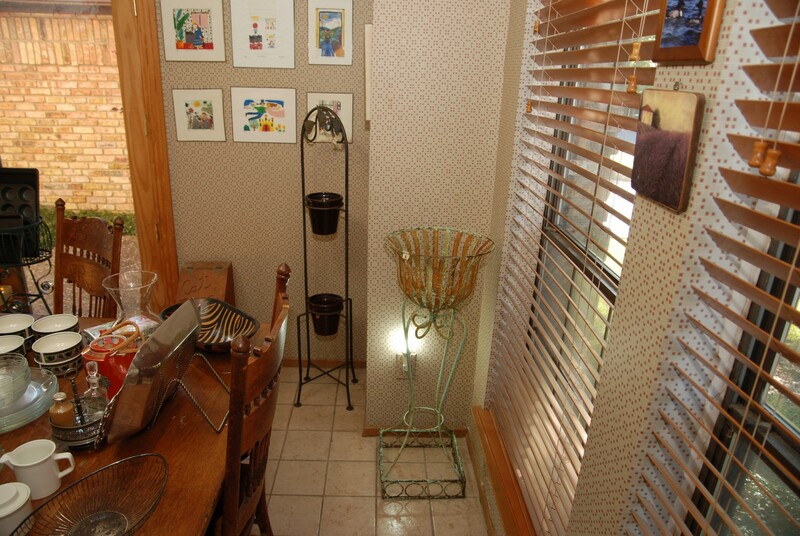 There is a five foot ladder and a folding step stool. 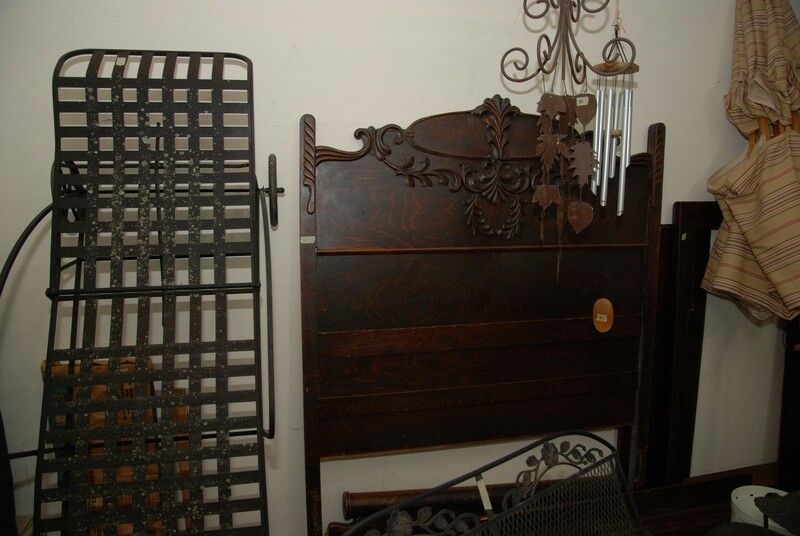 We have a nice antique headboard, footboard, and matching wooden rails. The set needs a little tender loving care. 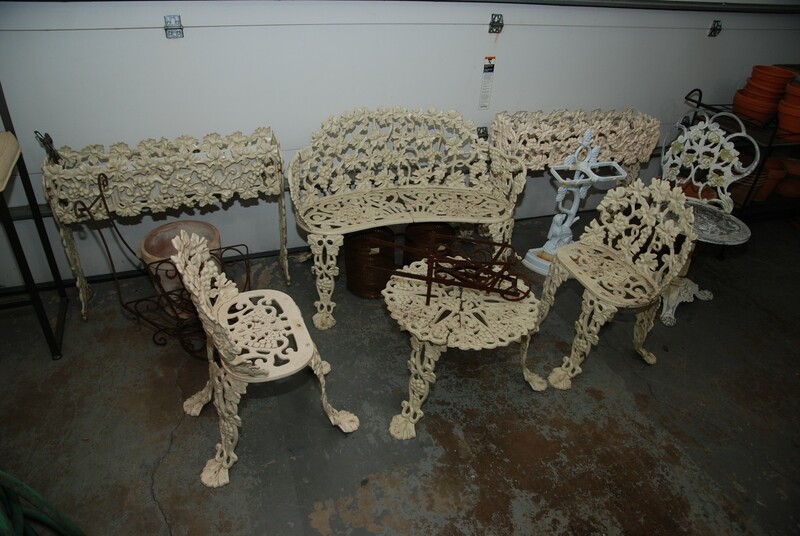 We have a nice set of Cast Iron Patio Furniture. There are two Cast Iron Planters (hard to find), a Cast Iron Love Seat, two Cast Iron Chairs, and a small round Cast Iron Coffee Table. 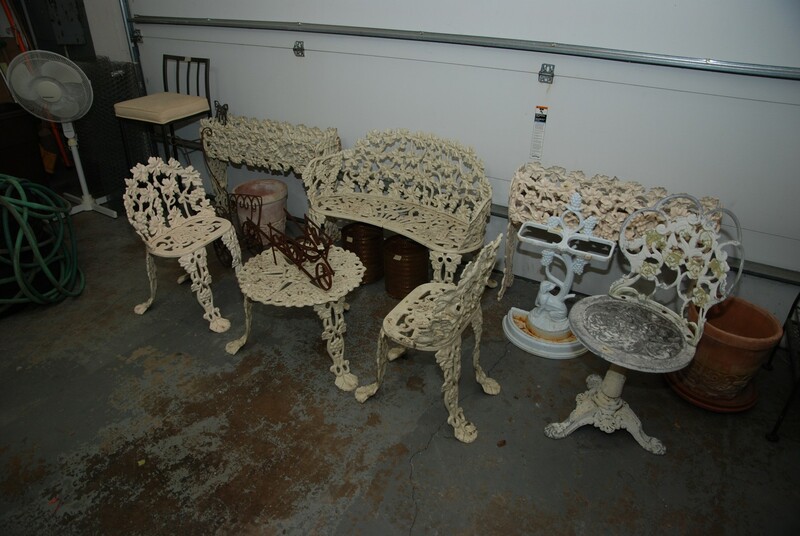 There is another pedestal Cast Iron Chair that would be a great addition to your garden scape. In addition we have a Cast Iron double Planter / Holder. There is a bar stool and a floor fan. We have a nice garden hose and a garden hose caddie. 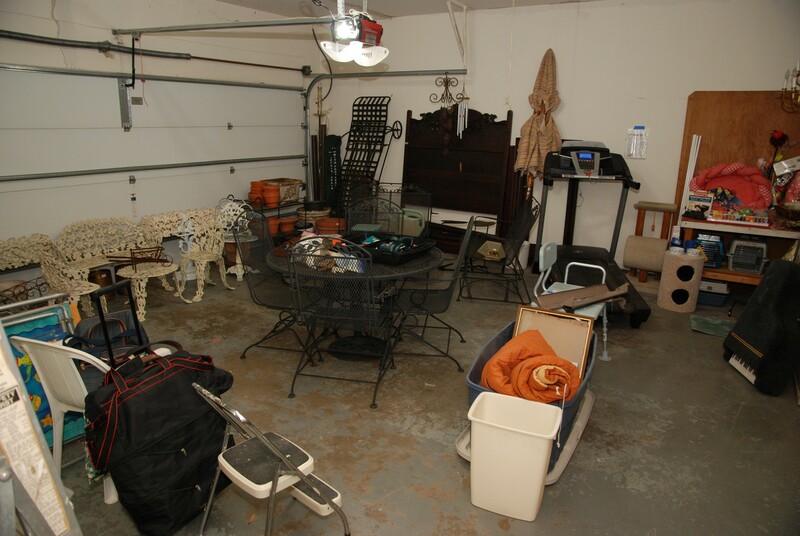 There are two folding patio chairs and some duffle bags. 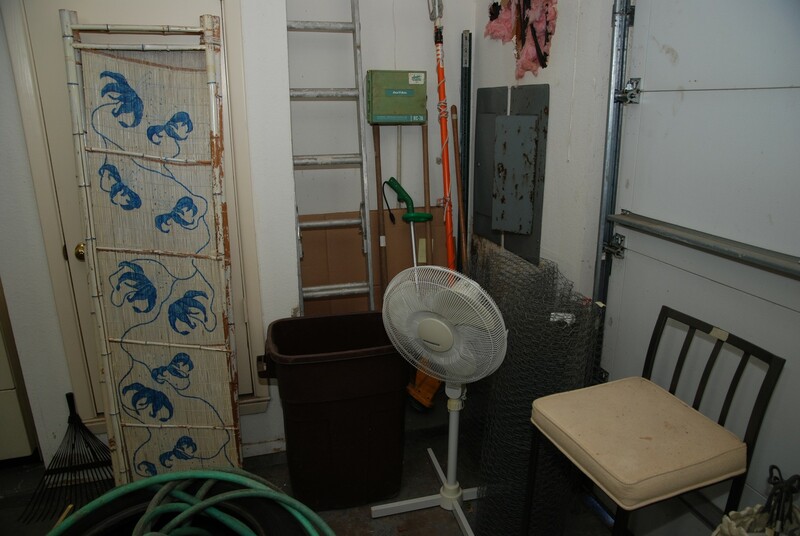 There are some hand tools and bags of fan parts. 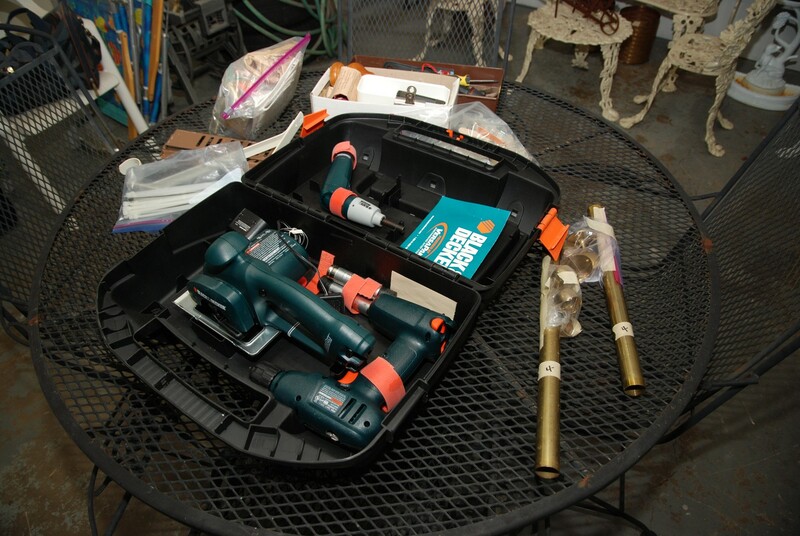 There is a Black & Decker Tool set that is rechargeable with a carry case. The rechargeable batteries have been tested and work fine. 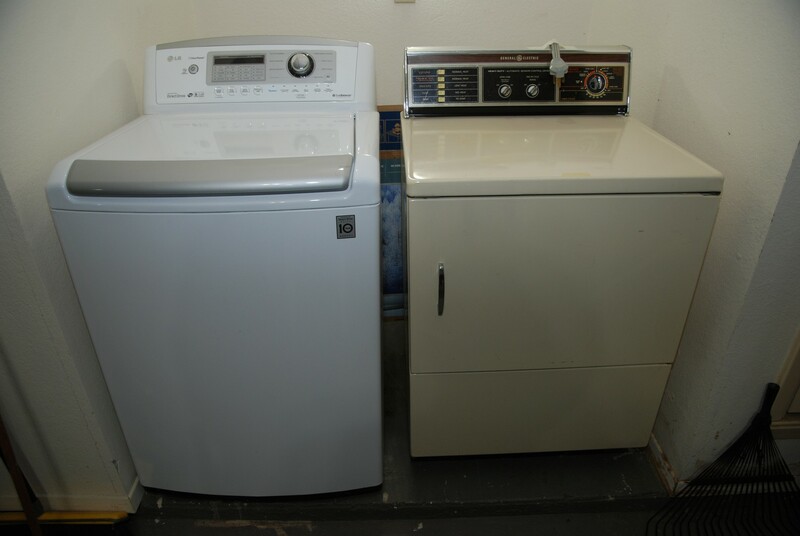 If you are looking for a great Clothes Washer, we have an LG Wave Force Direct Drive Large Capacity True Balance Anti-Vibration System. 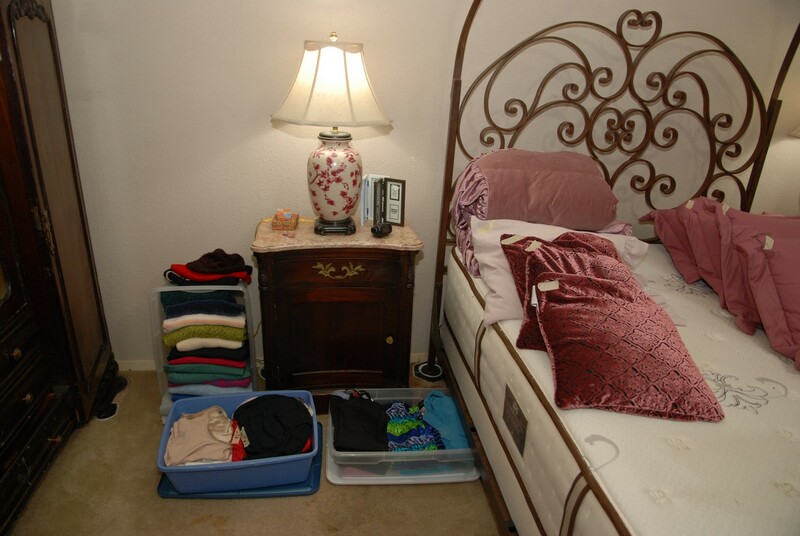 It is white and will hold a large comforter in its oversized drum. It comes with the user manuals. 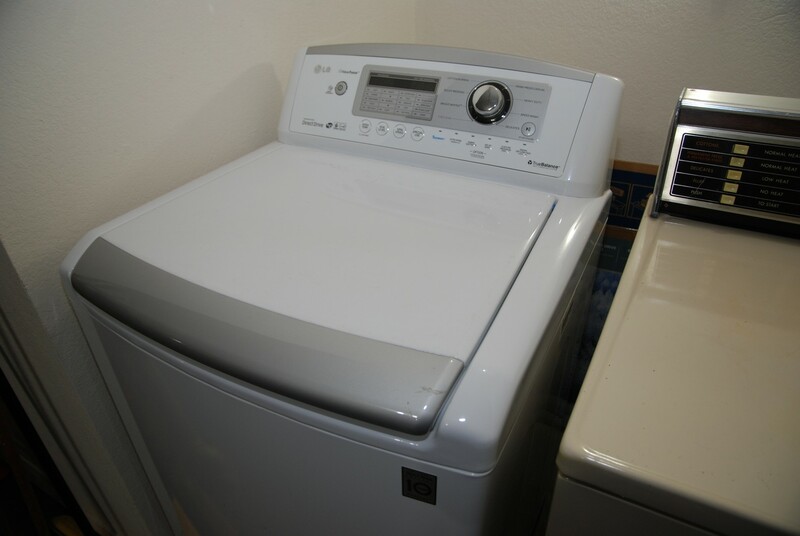 We also have a General Electric Dryer which is Heavy Duty Automatic Sensor Control. It is Yellow (golden) in color, and it too has its manuals.